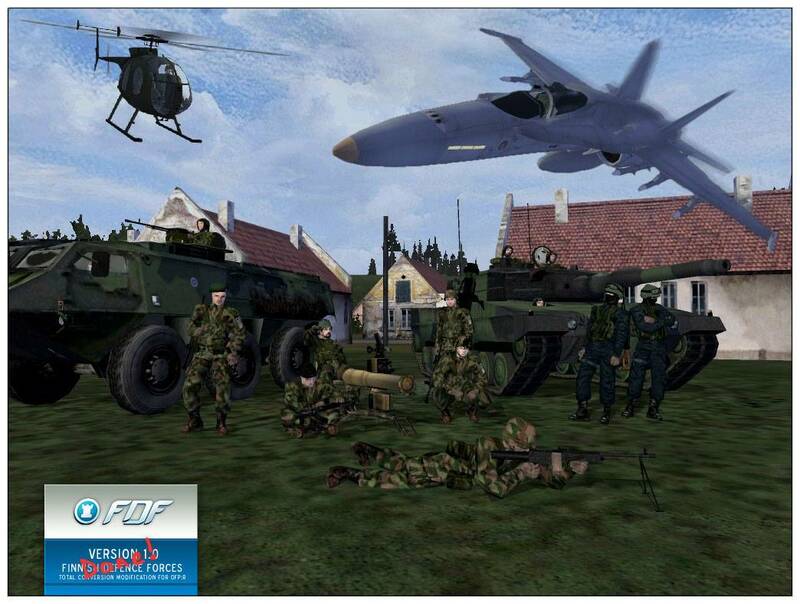 Working installation of ArmA 2 and Operation Arrowhead expansion or ArmA 2:Combined Operations. Patch 1.54 or greater recommended. 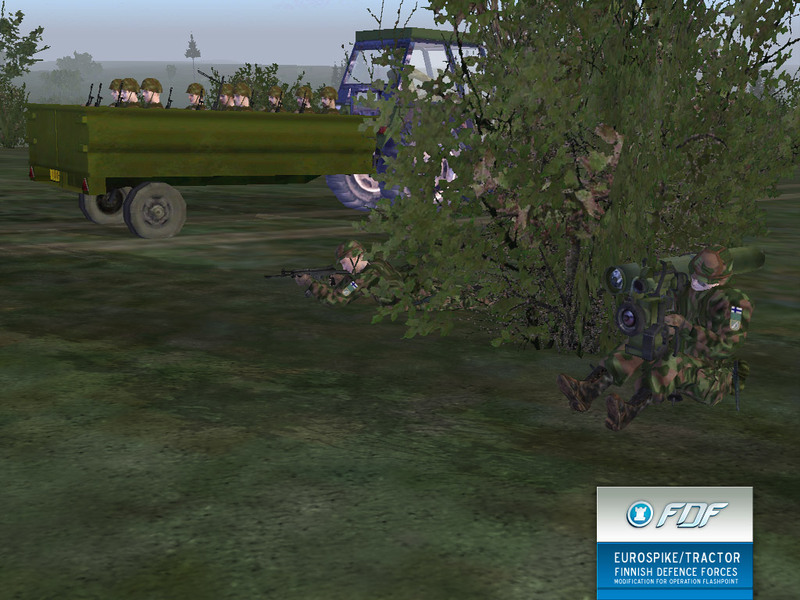 Following severe internal clashes on Podagorsk Finnish Defence Forces holds maneuvers for possible deployment to the conflict zone. 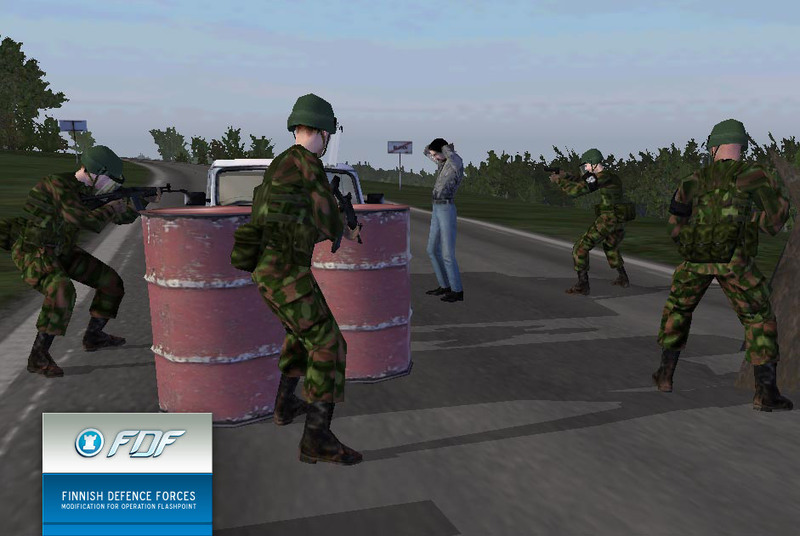 Media has speculated that the deployment likely takes place “in the near future” and should that occur the FDF troops will operate under the NATO-led coalition with UN mandate. 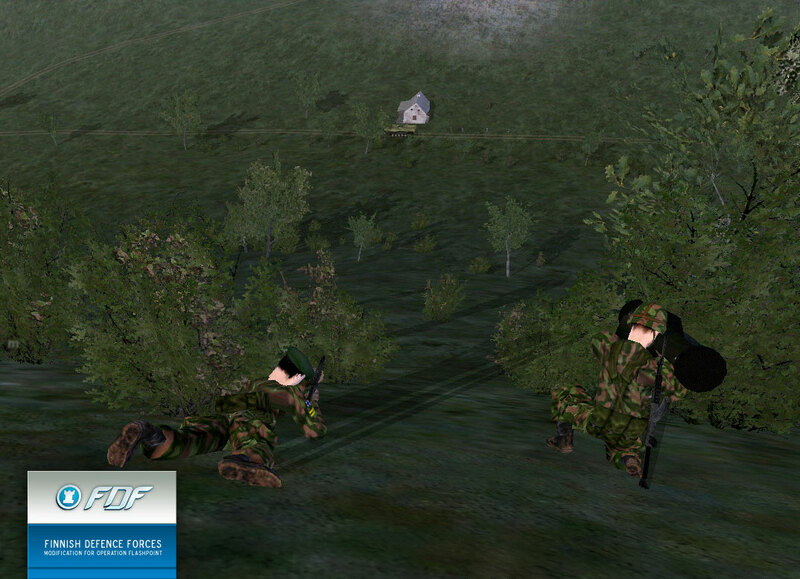 The latest incarnation of FDFmod will require up to date version of both ARMA 2 and Operation Arrowhead. 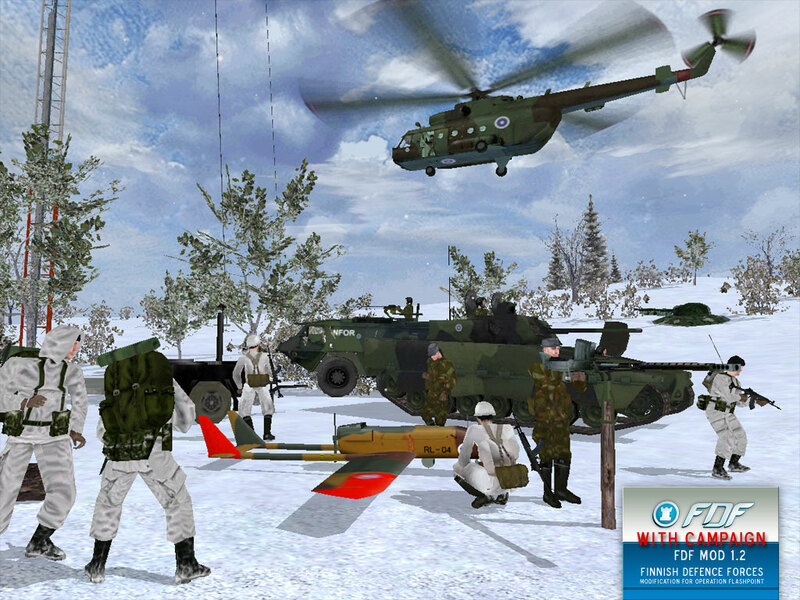 Finnish Helicopter Battalion trains personnel needed to maintain flight readiness, to perform service flights for FDF and to give assistance to different authorities. 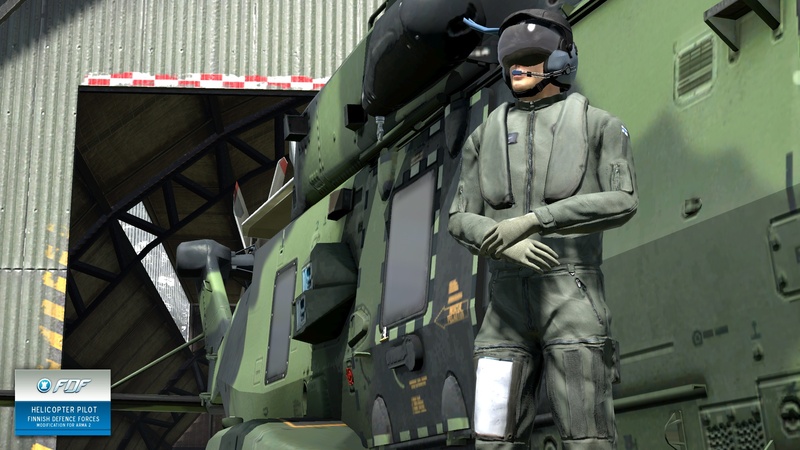 Since 1962 all FDF helicopters are based at Utti Air Base and are part of army aviation. 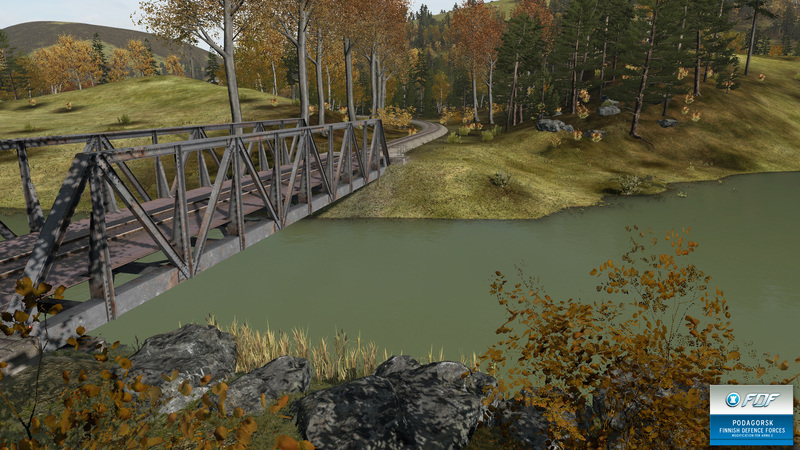 Bridge leading to hotel works now with AI, also raised up the bridge several meters. Added few heliports to east base. Removed few bushes from roads. 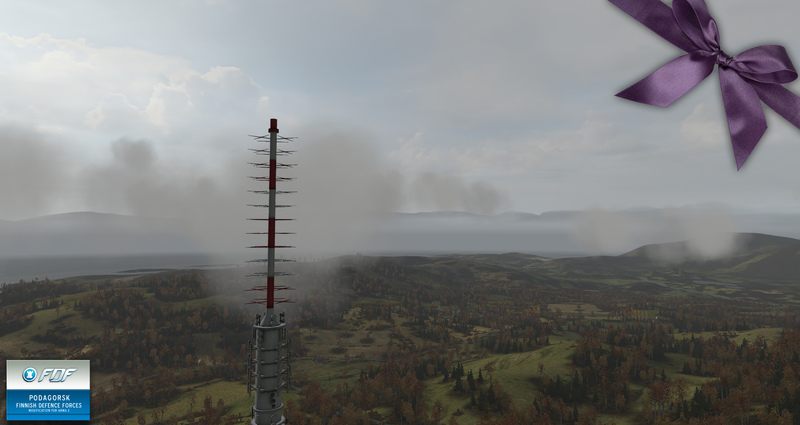 Removed hovering tree above Kirsanov. Removed hole from the swamp. Added some invisible roads to runway and changed roughness values. Ambient civilian module now works. Due several requests added landmass between airport and main land. 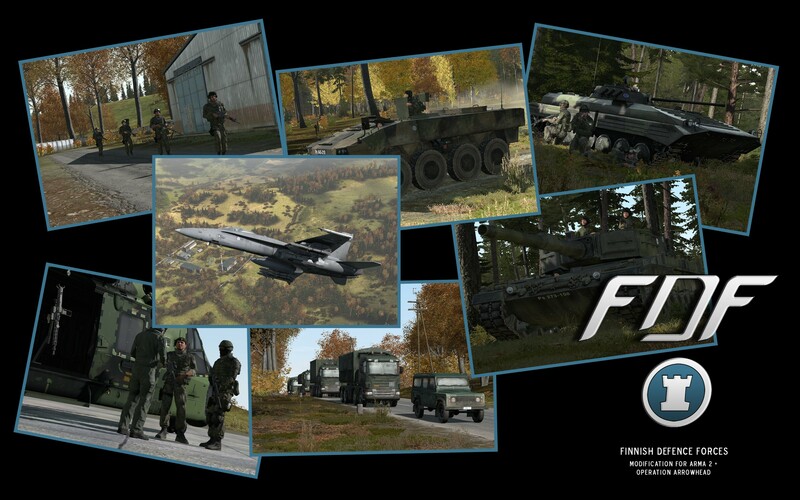 FDF Podagorsk requires a working installation of ArmA II: Version 1.0 or higher. 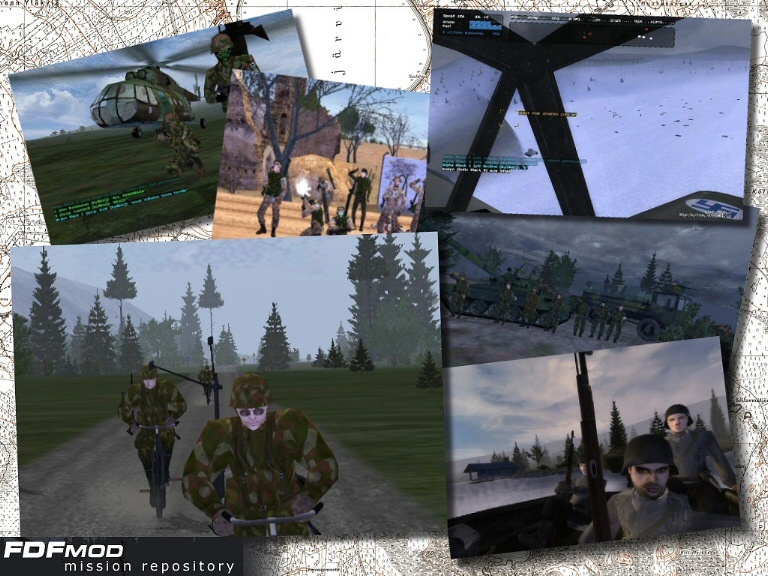 To install it, just extract FDF_Podagorsk_v11.rar to your ArmA 2\Addons directory or use modfolders. Sidewinder and AMRAAM anti-aircraft missiles. 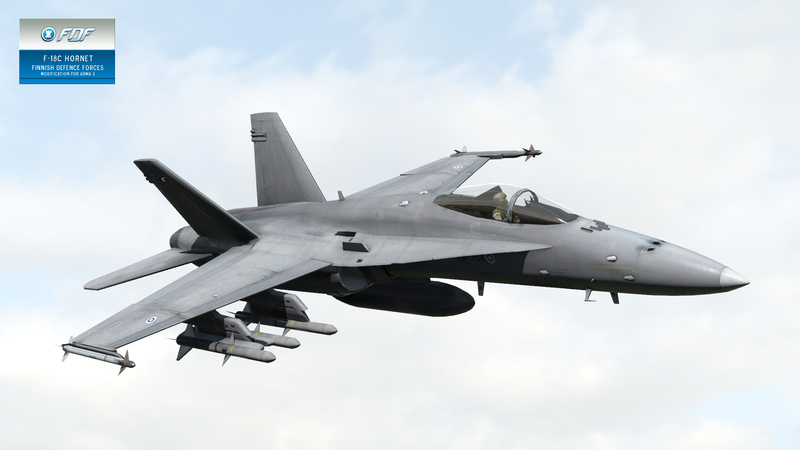 Recent plans of the FAF also include the possibility of guided air-to-ground weaponary such as AGM-65 Maverick. 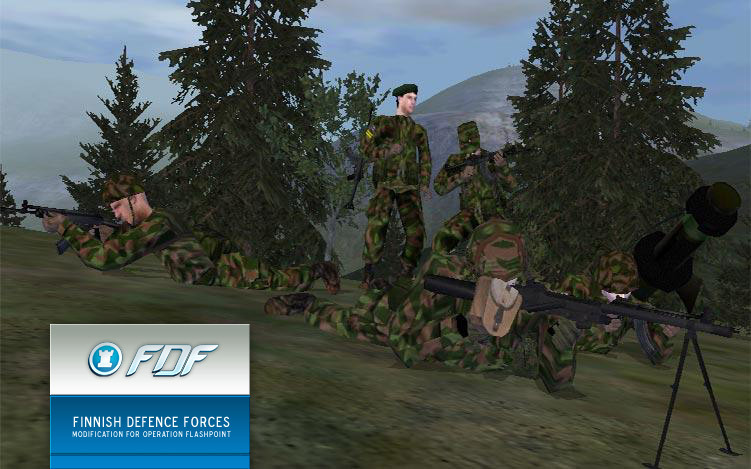 New terrain as a playground has been an essential part of FDF Mod. There were East Border and Rukajärvi for OFP. There was Podaga for Armed Assault. Of course we need something now, too. Podagorsk is an extended version of Podaga. For latest screenshots, there is a huge 50 MB rar archive. 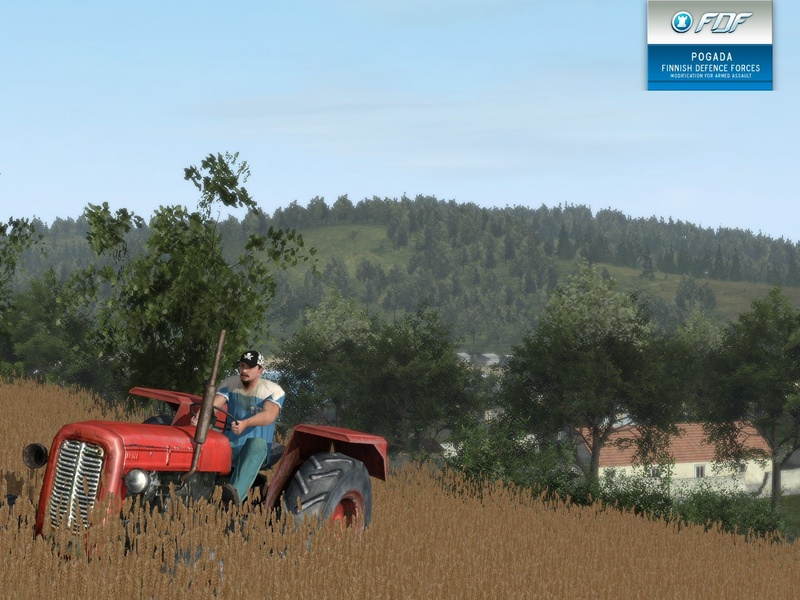 Invidual screenshots will be posted at both our own and BIS forums. NHIndustries NH90 helicopter hovers above the treeline during a landing exercise. 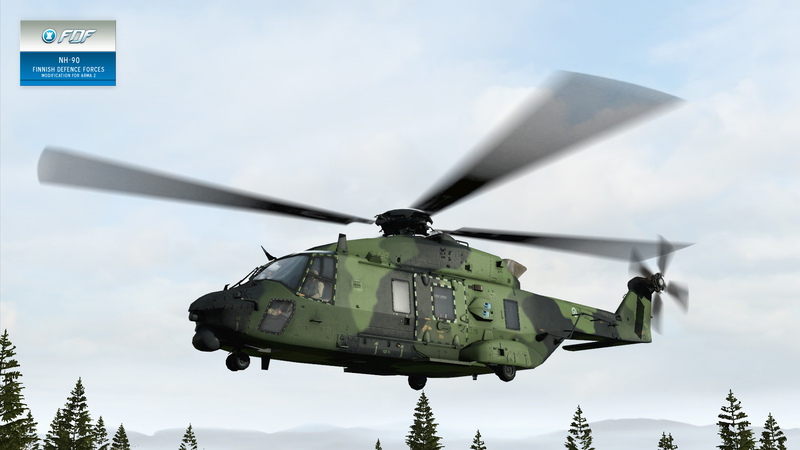 NH90 is a state of the art aircraft which has recently entered service across Europe. Finland has chosen the SAR (search and rescue) variant and first helicopters have been in service since 2008. The legendary British Land Rover brand entered FDF service in 2000. Land Rover 5D Defender seen here is a four wheel drive cross-country vehicle that is used for troop and equipment transport. It was purchased to replace the aging Toyota Land Cruisers and Soviet UAZ utility vehicles. This beast from Germany touched the Finnish soil for the first time in April 2003. Total of 124 new Leopard main battle tanks replaced old T-72s giving a great amount of performance compared to its old Soviet rival. The chobham-layered 55 000 kg steel monster is equipped with a hard-biting 120mm Rheinmetall smoothbore main gun and two 7.62x51mm MG 3 machine guns. 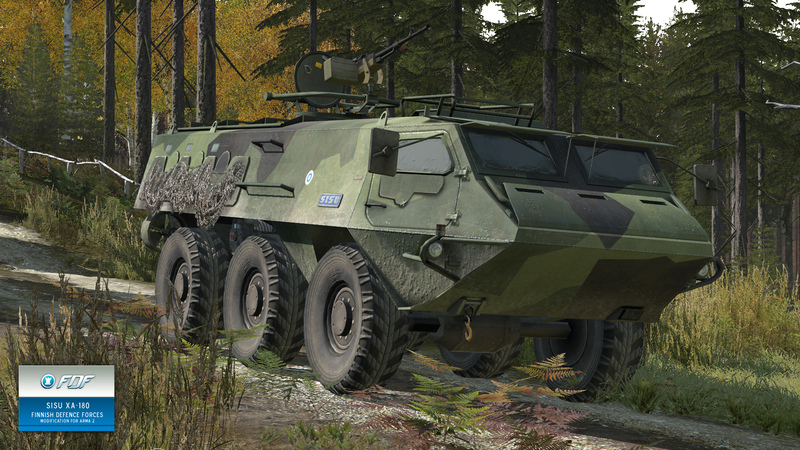 The workhorse of the Finnish army, XA-180 armored personnel carrier, is seen here on a forest road during trials. XA-180 entered service in 1983 and is operated not only by Finland but also by other nations in numerous peacekeeping operations. 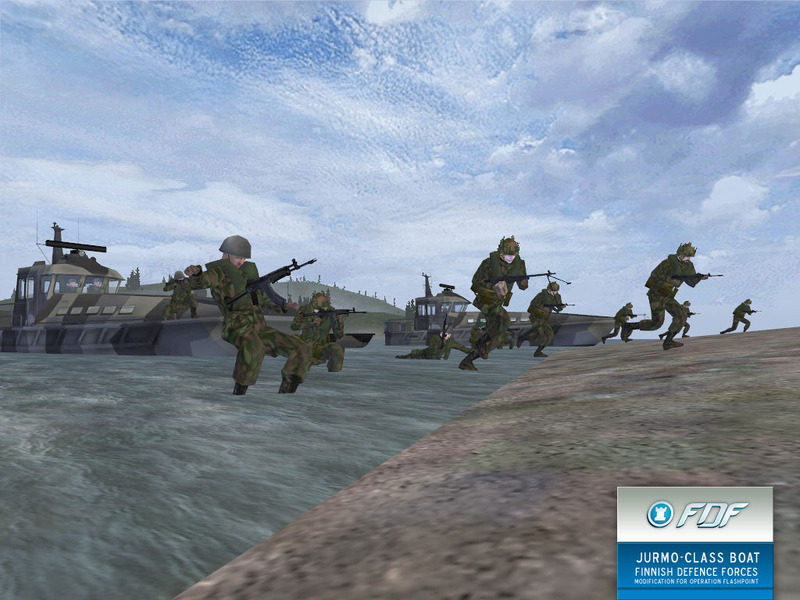 The vehicle is fully amphibious and can carry two infantry squads. Several variants have been developed along the years, culminating in the Advanced Modular Vehicle (AMV) design. 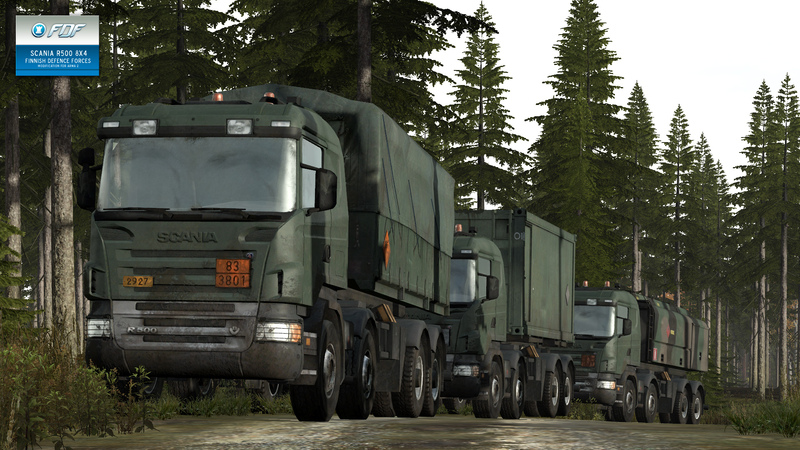 A convoy of Scania R500 8×4 trucks parked beside a gravel road with ammo truck in the front followed by repair and refuel variants. 192 Finnish-built general purpose trucks were recently purchased by FDF after EU-wide contract competition was won by Scan-Auto Finland Ltd.
Scania trucks will phase out various outdated trucks such as Soviet-built ZILs. 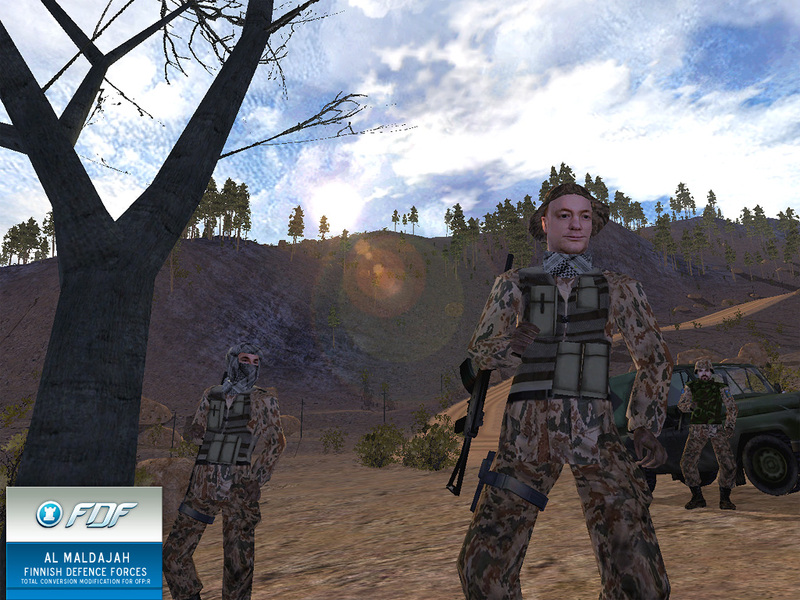 With these news FDFmod has jumped on the ARMA 2 bandvagon. Requires Arma v. 1.14 or higher and Queen’s Gambit expansion. Please see Downloads page for mirror listing. Hello again, guys. Summer has turned to autumn and new breeze is blowing in my boring life too. First, I’d like to share with you some old snapshots from early 90s when I had just finished high school and made a holiday trip to nice little island called Pogada, located near United Sahrani. Communist regime had just been overthrown and people were enthusiastic and even naive about the prospects of capitalism. Now you may ask why these old photos? Well guess what, I have re-enlisted back to service in the Finnish Rapid Deployment Force and assigned its HQ company. We are about to be deployed to Pogada. There’s been a bit of unrest there after some dramatic events took place in United Sahrani sometime ago. Maybe the top brass thought I could be useful as a liasion officer since I do have some rare real-life experience in peace-enforcement operations. Anyway, I’m off soon and maybe not able to update my blog for some time since internet connections are not my main concern when I get there. Wish me luck guys…CU. Hello again, guys. This is a shot of some of the latest hardware that the Army possesses – the versatile Patria AMV – Armored Modular Vehicle. The ride I was offered was more smoother and steadier than in the old tin can XA-185 PASI which hauled me during my conscription. This version is armed with American M2 HB machinegun in remote-operated turret similiar in fashion to that of Stryker APC. Anyway after the official part was over we did some plinking with various firearms. The foreign gentleman at the front immediately wanted to try out my M31 ‘Suomi’ submachinegun and Pertti, my old army buddy tested the M39 rifle from my modest historical firearms collection. The elderly man liked how the M31 operated and sprayed two full drums at the target, despite forgetting his radio gear on which we used earlier on our practical-shooting expiriment. I didn’t find out what he does for a living but I bet it involves handling various guns. To sum it up, it was a fun weekend! Sorry for the lack of updates but I’ve been working hard at my job, trying to get a big project finished during the summer. Here are couple of shots from last summer’s refresher course for you military enthusiasts, first of which shows beret-wearing reservist taking potshots with a “trusty” old M80 pistol. The latter one is a picture of 12.7mm ITKK equipped with optical anti-aircraft sight. The heavy tube being wielded in the third shot by some AT guy is the infamous 112 RsKes Apilas, bringing memories from those long marches years ago when I had to haul two of them, one on each shoulder. At the refresher exercise I got to shoot with TRG-42 (8.6 kiv 2000) and kick was heavier than old TKKIV 85 but the ballistics is way better, extending range 100s of meters further than that of the old rifle. Hi all, I just wanted to share some memories from last summer’s refresher course which was held at Niinisalo drill area. The weather was hot but we got to wear the brand new M/05 camouflage suits which were comfortable enough, although an ‘old hand’ like me still prefers the old M/62 camo. One of the officers in charge is my good mate, and allowed me to hang around as unofficial ‘combat cameraman’ after my part in the drill was finished. 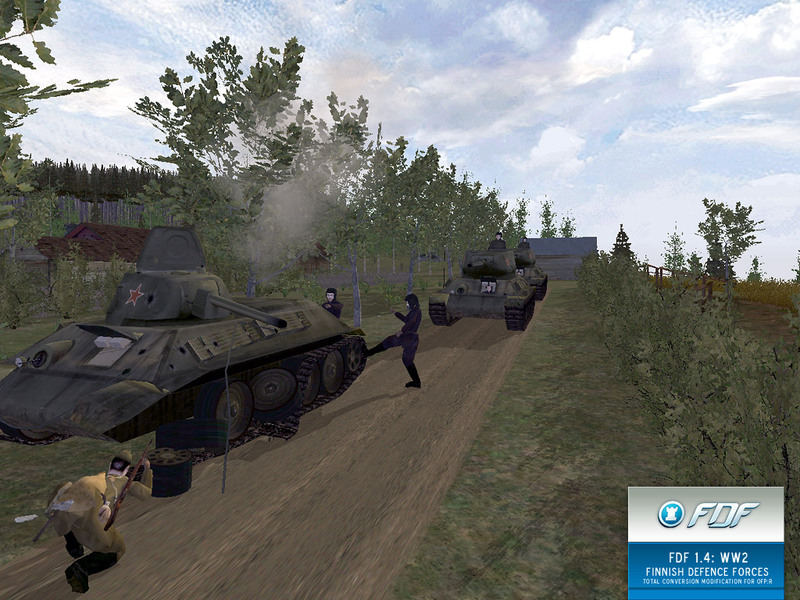 Here’s a shot of two conscripts from Pori ambushing ‘friendly’ BMP-2 with dummy 66 KES 88 AT launcher (although the yellow stripe indicating a dummy weapon is missing and guy at the front has lost the blank adapter from his RK 95 assault rifle!). 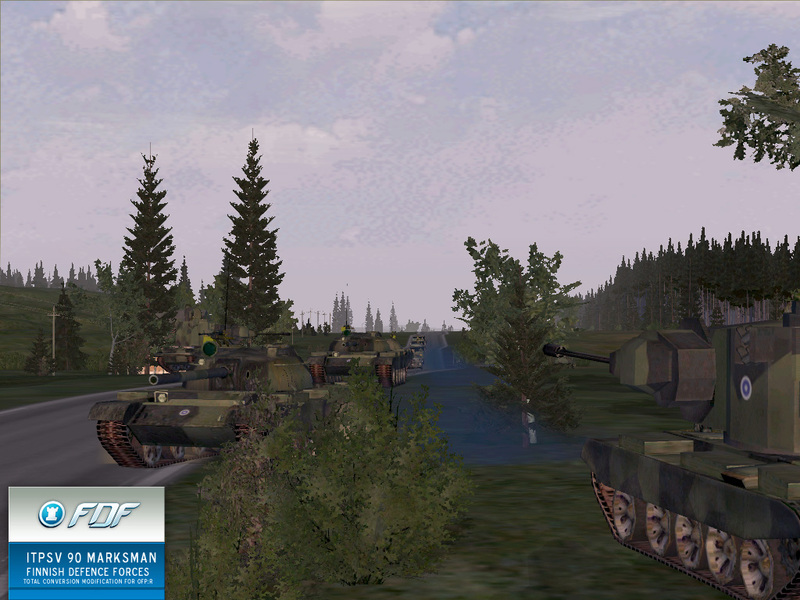 Finnish Rapid Deployment Forces soldier and BMP-2 from Armored Brigade take part in joint exercise in a forested area. Soldier is equipped with new M05 camouflage suit, M05 ballistic vest and M05 equipment vest and is carrying modernized version of Russian-manufactured PK machine gun. 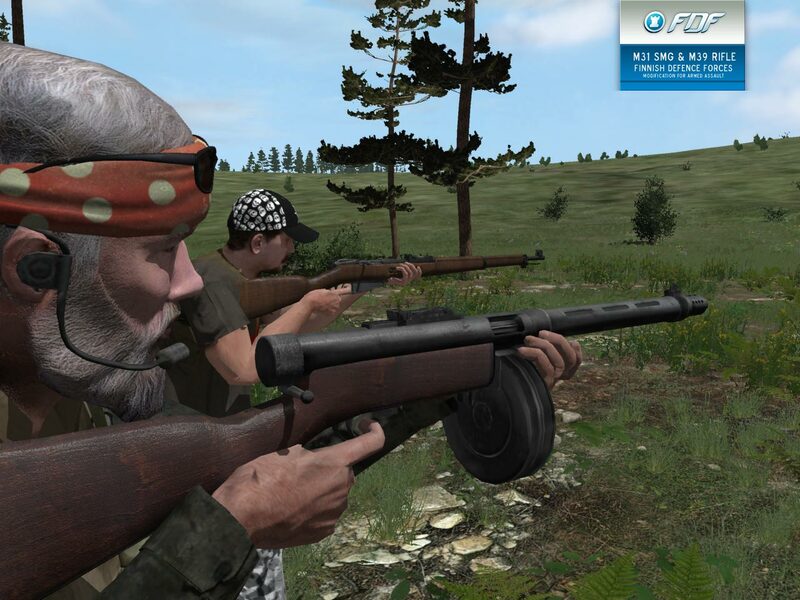 Stay tuned for more news when modding tools are released, same FDF time, same FDF channel. Our well-known travel agency Saarinen & Lahtinen, Helsinki, is proud to offer you this season’s visits to the finest resort of Baltic Sea, romantic and peaceful island of Suursaari. 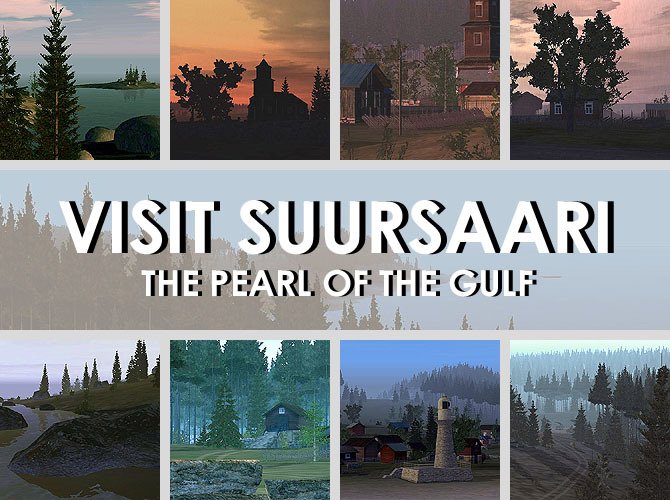 No matter if you seek for quiet sceneries of natural beauty or possibility to show your swimming suit of latest fashion, Suursaari has it all! High cliffs, mountains, deep woods, dramatic rocks and more natural beauty than you can imagine! Evening dancing (featuring jazz orchestra of Ville Haapasalo), row-boats for hire, fish restaurant, beach of Suurkylä bay and dozens more atractions only island in Baltic Sea can offer. Accomodation in pleasant private residences across the island or in modern hotel rooms, both in unbelievably reasonable prices. We provide accomodation services in both villages, Suurkylä and Kiiskinkylä. All you have to do is to visit our office and be offered the trip which will suit your taste and wallet. Special discounts for families and army officers on vacations! 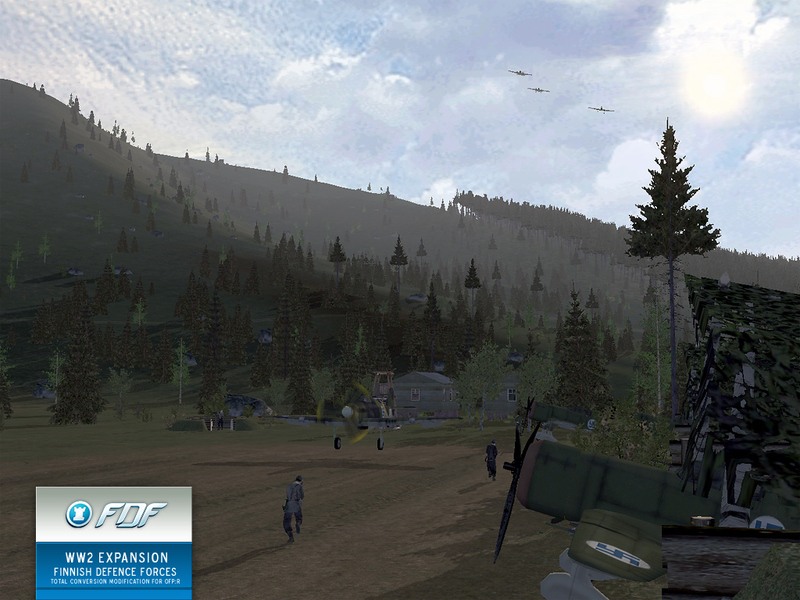 Suursaari Project was made by Edge from CSLA Mod with support of FDF Mod developers as tribute to WW2 expansion. Soviet supplies and weapons litter the battlefield along with bodies and horse carcasses in Porlammi pocket, south of Viipuri in September 1941. 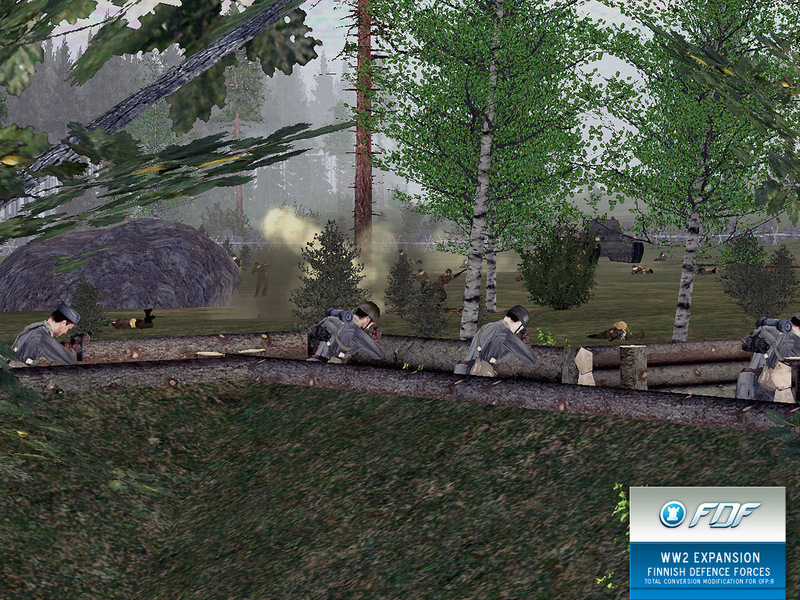 Men of Finnish 4th division scavenge useful enemy equipment, among them useful 122mm howitzers. Soviet DB-3 medium bombers surprise Finnish Air Force (FAF) airfield pants down as a Hurricane fighter is about to land and Fokker D.XXIs are being serviced in their log-reinforced hangars. Ground crew scrambles for shelter before deadly rain of bombs falls down. 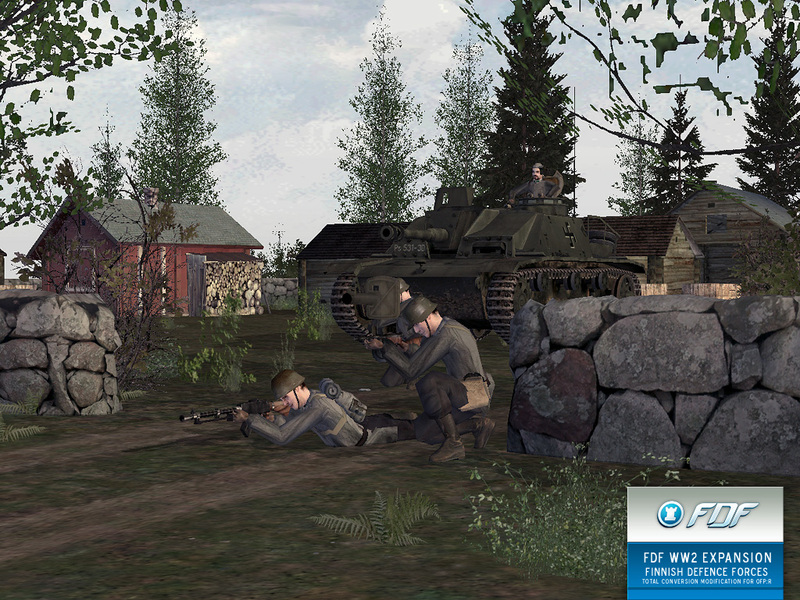 The FDF team is working on WW2 Expansion which concentrates on combat in the Finnish frontiers from 1939 to 1945. 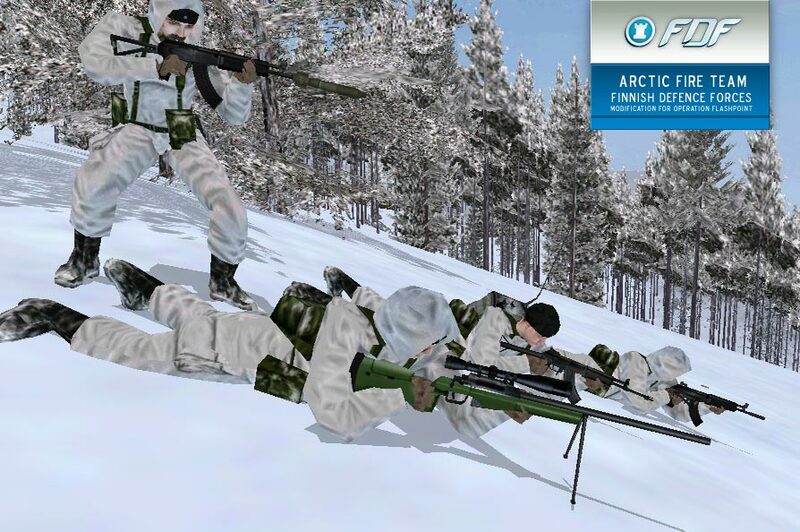 Three separate conflicts are included: The Winter War (39-40), the Continuation War (41-44) and the Lapland War (44-45). 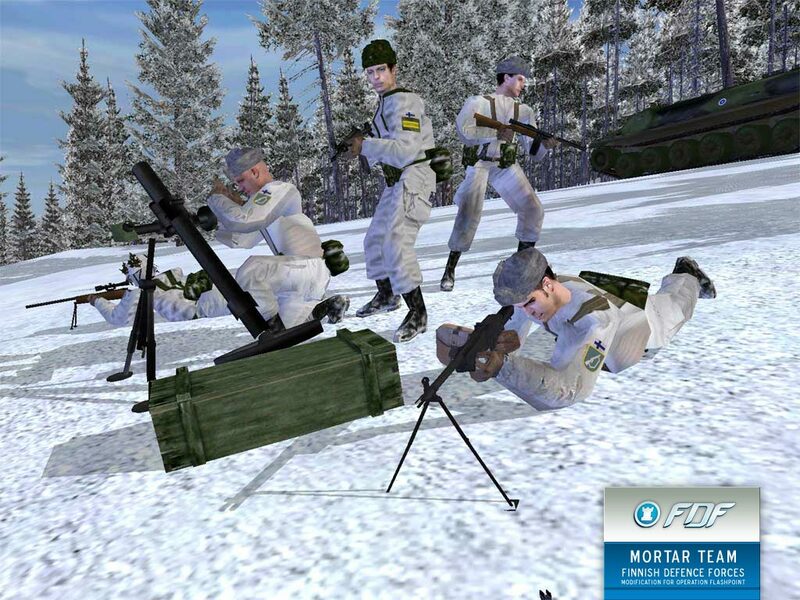 Our focus is primarily on the Continuation War and the fierce decisive defense battles fought in the summer of 1944. 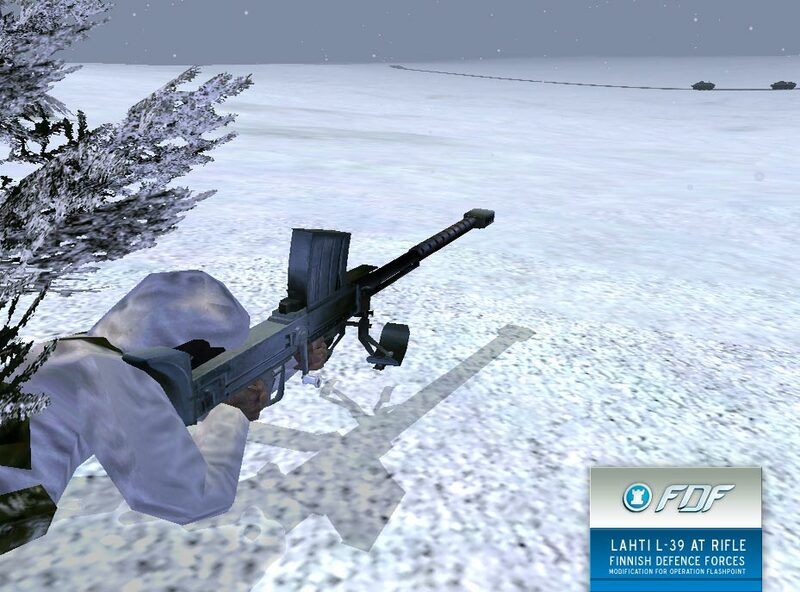 Supported by a Sturmgeschutz 40 G and equipped with a Panzerschreck, Finnish infantry is prepared for the inevitable Soviet assault in June 1944 after years spent in trench warfare. To install, extract this archive to your Operation Flashpoint directory. Make sure you use latest version of RAR software. Size of download is about 14.8 MB. Look at downloads page for mirror listing. 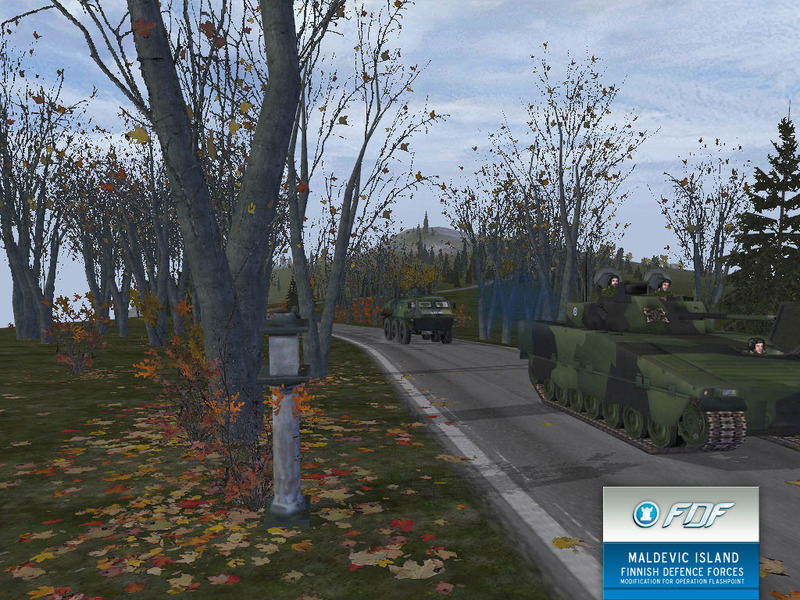 Custom Island “FDF: Maldevic”, Malden with new objects, fields, textures and cities. 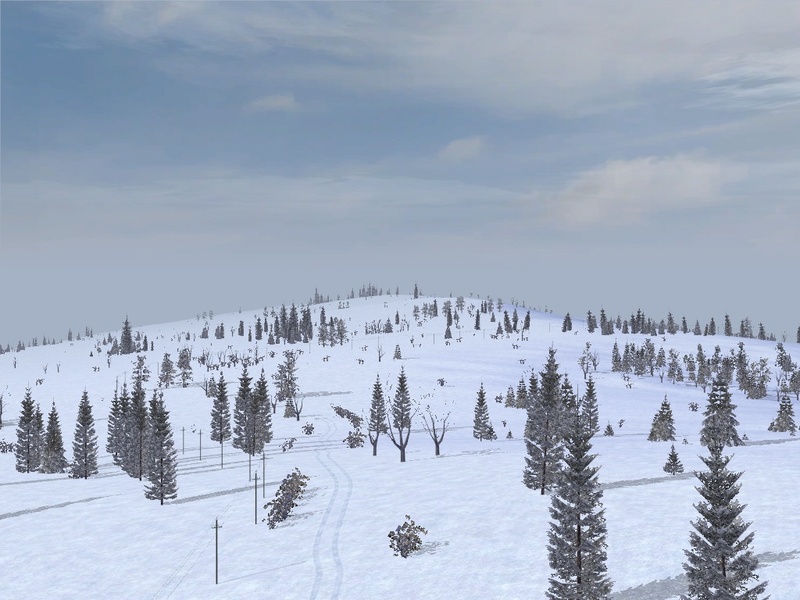 Reworked FDF: Eastborder with custom Finnish buildings, city layouts and fields. Steerable & re-packable parachutes, new NV goggles, smoke grenades for tanks, working handcuffs for police and MPs, carriable fuel canisters, etc. Finnish Coastal Jaegers storm an island held by the enemy troops only to be pinned down by machinegun fire on the waterfront. They have been transported to the beach by Jurmo-class coastal assault boat which is designed especially for coastal warfare. Jurmo is powered by waterjet engines, thus enabling cruising in extremely shallow waters with speeds in excess of 30 knots. 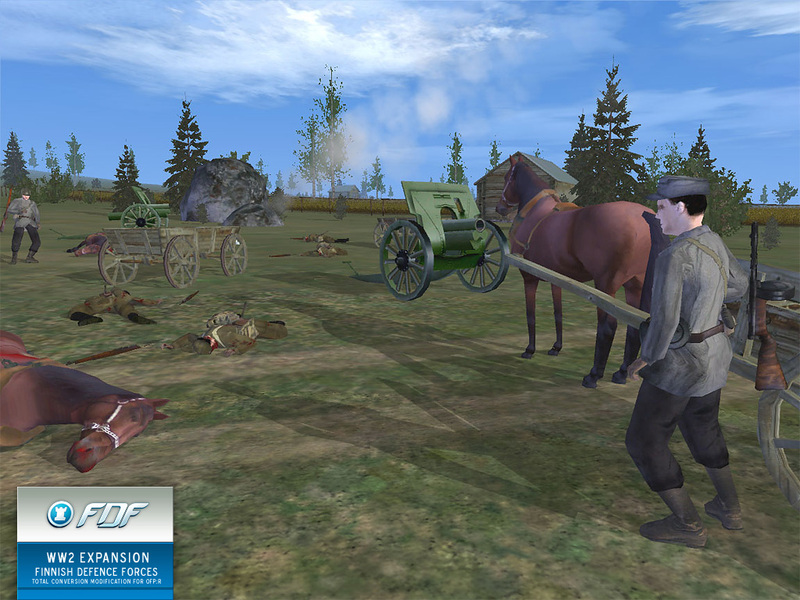 Jurmo is capable of transporting up to 20 troops with a crew of two. Optional armament includes a mount for 12.7mm ItKK heavy machinegun. Russian Shmel-1 UAV is prepared for launch to observe enemy positions and a BRDM-2 recon team is being briefed for their upcoming scouting missions towards same direction. Despite modern UAVs there is no substitute for on-ground human reconnaissance. 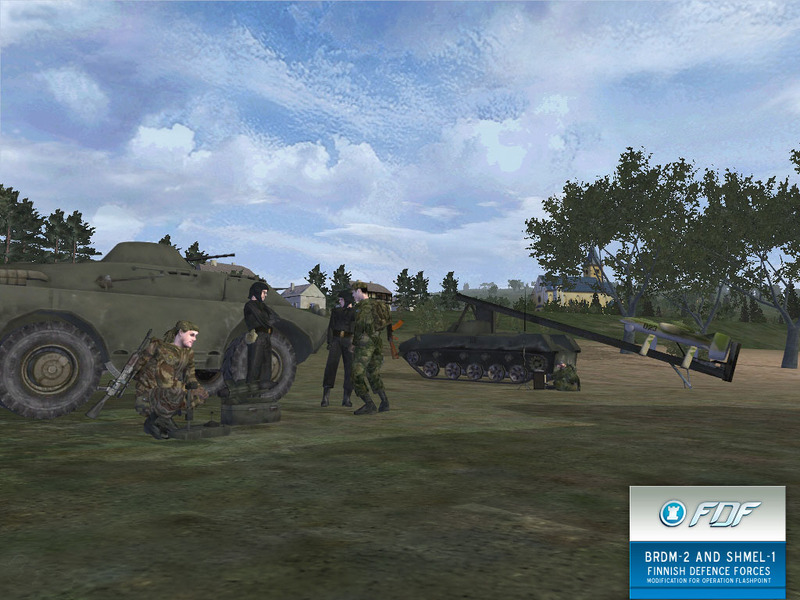 On the foreground AT-3 ‘Sagger’ is being inspected by weapons NCO. The Shmel-1 (Yak-061) UAV is just one of several types of UAVs in service in Russian Army today and it has been exported at least to Syria in 1992. Shmel-1 catapult is typically mounted on a BMD platform. 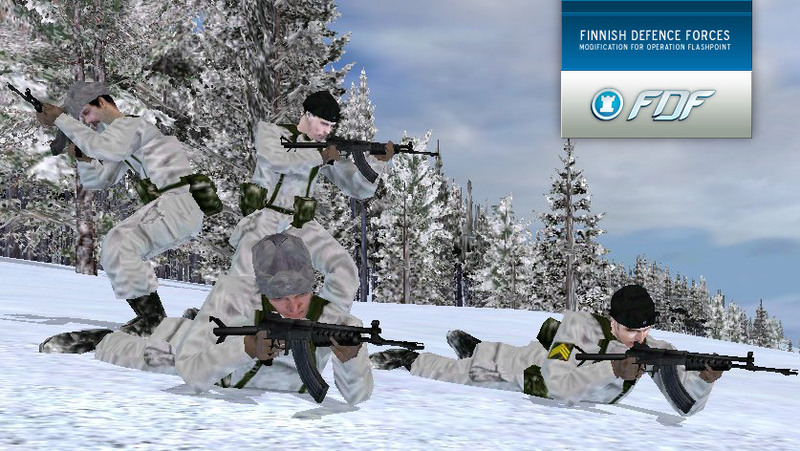 Finnish paratroopers queue for a jump training on a biting cold clear day while their comrades practice low-level parachuting methods nearby. Since the 60s Dutch Fokker F.27 Friendship/Troopship series has been widely popular transport aircraft. It replaced DC-3s in Finnish service but now only one remains in FAF service as jump trainer plane, one as Electronic Warfare aircraft and third has been sold for aviation mechanic training purposes. The Troopship is capable of transporting 44 paratroops in addition to crew with cruising speed being 480 km/h. 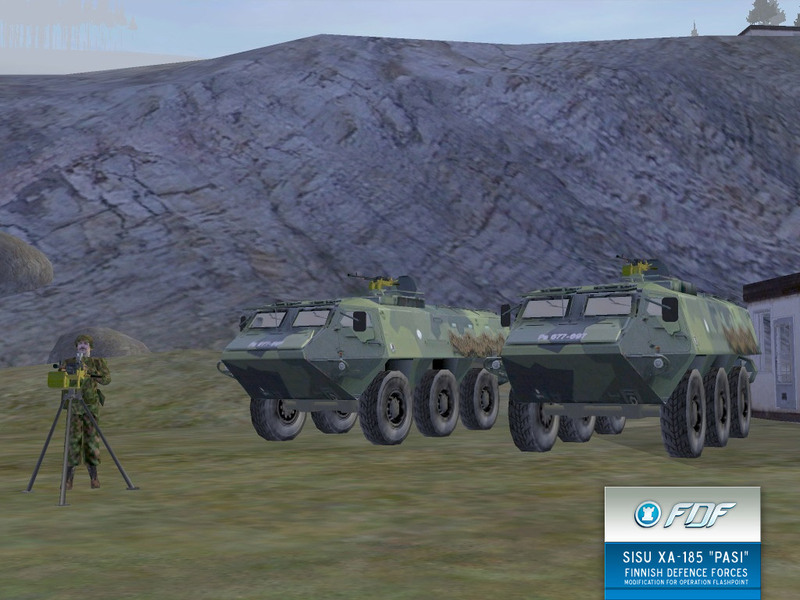 Three Finnish Itpsv 57s lined up for anti-air duties as a part of Armoured Brigade’s annual exercise. They are used to keep battalions’ equipment safe from distrubing factors coming from above. Itpsv 57s (aka ZSU-57-2) are built on shortened T-54 chassis with only four road wheel pairs. Vehicles are armed with two 57mm guns with practical rate of fire around 70 rounds/minute from both barrels. Maximum engagement range is between 3 – 4 kilometers. Nowadays these vehicles are consired almost obsolete and will face retirement or heavy modernisation in near future. 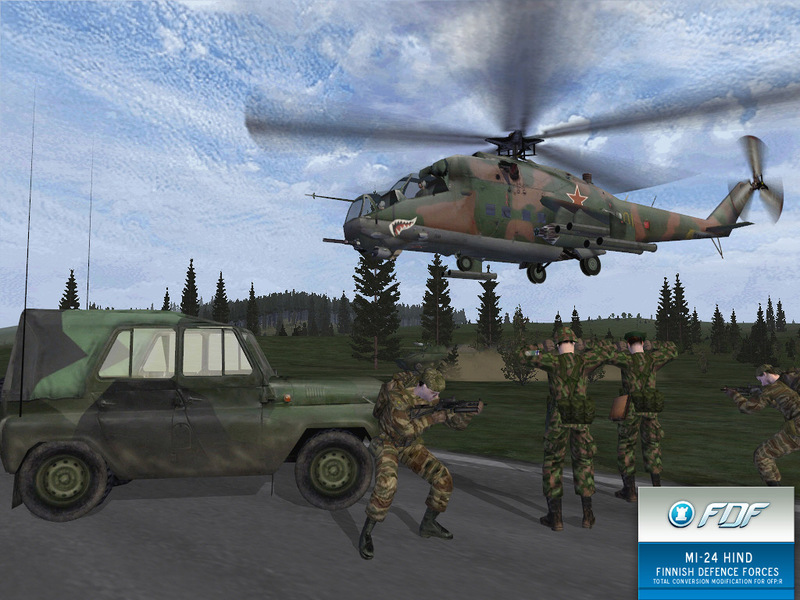 Just behind frontlines, a Mi-24 Hind hovers while Spetsnatz troop supported by APC prepare to transport two Finnish soldiers taken as prisoners after roadside ambush. The soldiers were conducting a recon mission near the border and got lost after navigation error. 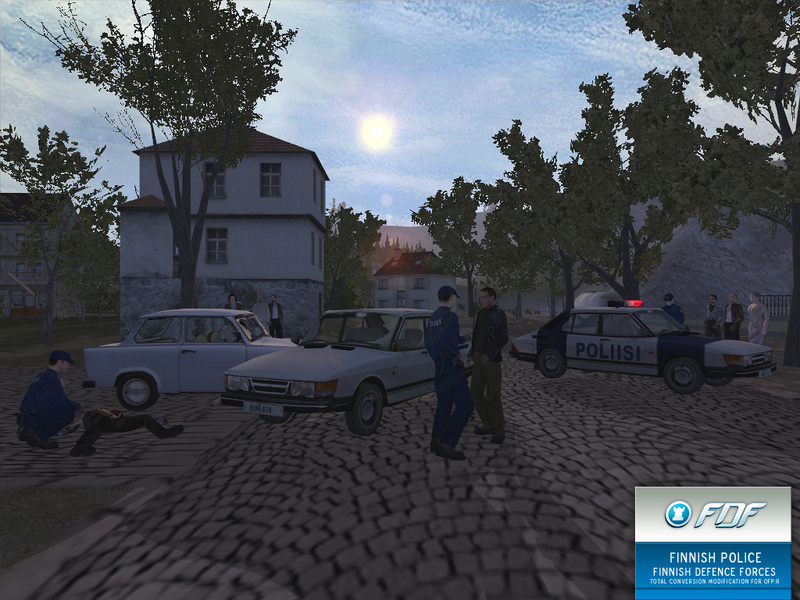 Finnish policemen investigating traffic accident in little village near East Border. One civilian dead and two others slighty wounded. Alcohol was involved in this accident. Drinking and driving is not fun. Finnish police used Saab 900i during 80s and early 90s. Policemen usually carry just Glock pistol as their armament, unless in difficult situation where they need extra stopping power like shotgun, sniper rifle or submachinegun. Handcuffs, flashing lights and siren included. The Saab J35 Draken entered service in 1960 in the Swedish Air Force. 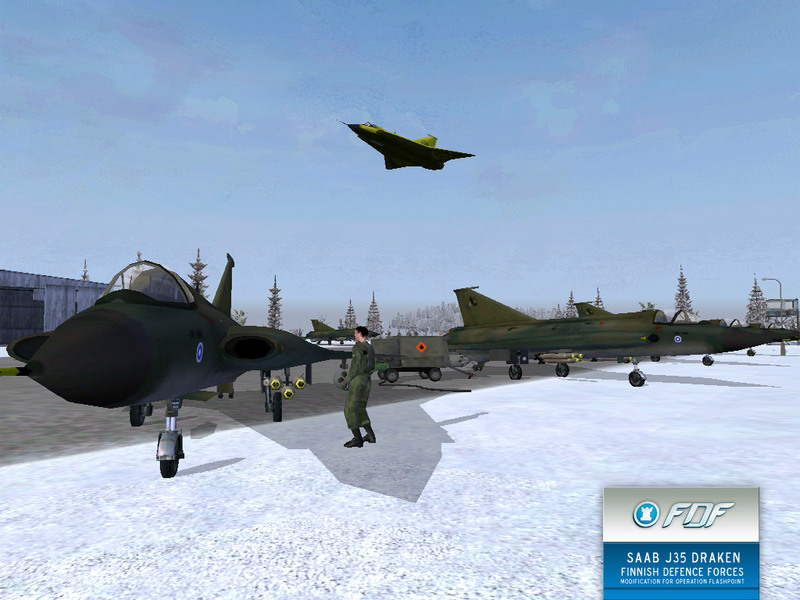 Ten years later the Finnish Air Force received first fleet of Drakens as the first export customer. Between 1970-1984 several batches of different Draken types were purchased and assembled by Valmet of Finland. They equipped no.11 and no.21 squadrons with the final Draken being phased out in 2000 with elaborate yellow ‘farewell’ paint scheme. They gave way to F-18 Hornets as did the MiG-21bis’ two years earlier. While designated as a fighter, the Draken could also carry bombs and rockets in addition to AIM-4 Falcons, Sidewinders and 30mm Aden cannon. 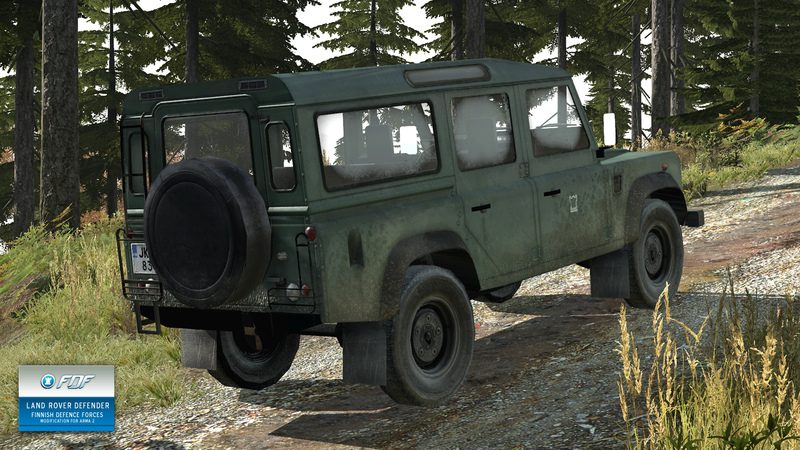 The versatile UAZ can be converted to various roles, for example to a mobile recoilless AT platform. Light vehicles armed with hard-hitting recoilless are capable of quick hit-and-run anti-armor attacks, striking fast and vanishing before the enemy has time to retaliate. The 73mm SPG-9 recoilless mounted on the Russian UAZ is similiar to BMP-1 IFV’s 73mm gun, firing the same fin-stabilized HEAT shells up to one kilometer with penetration exceeding 400mm depending on the ammunition type. Recoilless still holds it’s place in arsenals of many armies since guided AT missiles are expensive and fly much slower, exposing crews to enemy countermeasures. Mirror listing available at Downloads page. The size of the whole download is 300 MB. Size for 1.1 to 1.2 patch is 97 MB. Even more weapons and vehicles for FDF troops. Soundtrack featuring more tracks from Finnish rock band Airut. Some single and multiplayer missions. No campaign yet, sorry. 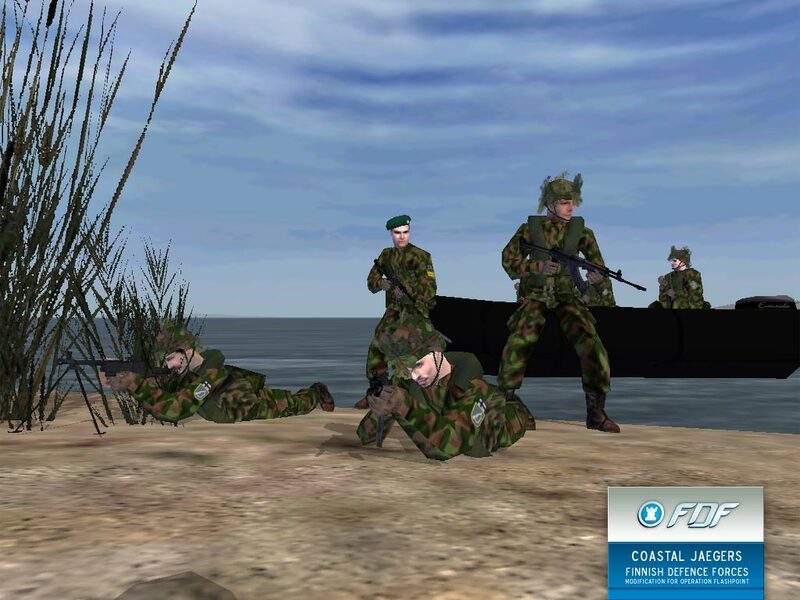 Custom Island “FDF: East Border” by Goeth. 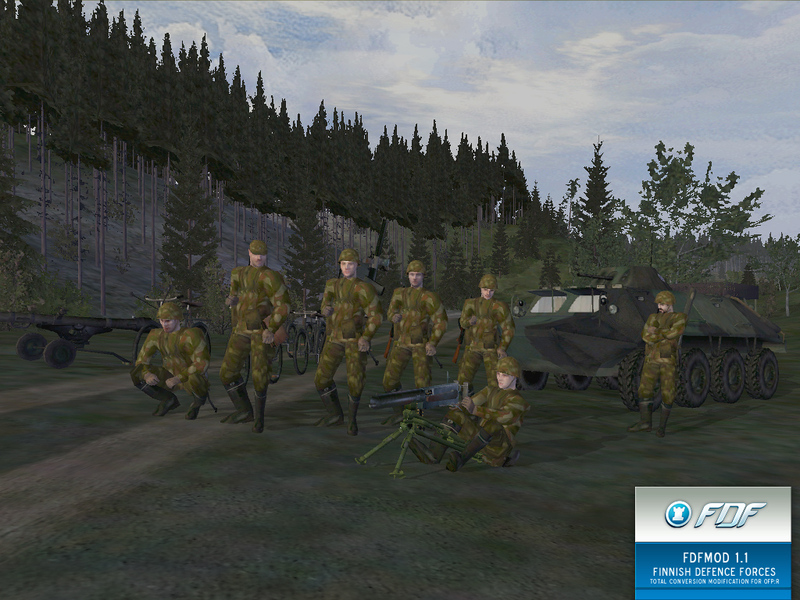 Finnish coastal jaeger conscripts are preparing to give fire support for an assaulting jaeger squad. They are armed with the Barrett 12.7 mm heavy sniper rifle, Heckler & Koch 69A1 grenade launcher and the RK 95 assault rifle with VV2000 attached. Transportation is provided by R-vene, also know as “Gruppbåt”. Manufactured in Finland, the boat is highly maneuverable and perfectly suited for the difficult Finnish coastal conditions. The R-vene can carry 11 soldiers in full gear and it can be armed with the NSV AAMG. 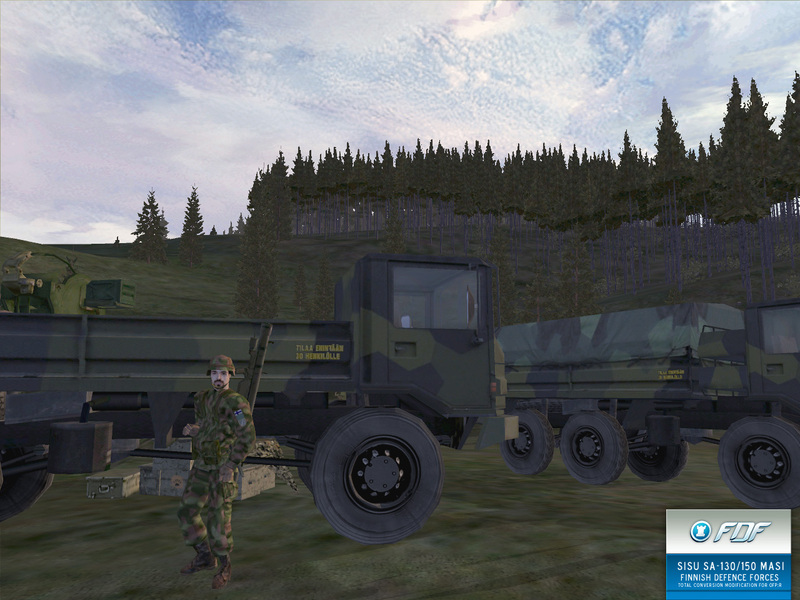 The Sisu SA-130/150 Masi is a multi-purpose truck developed for the Finnish Defence Forces. Apart from carrying supplies and infantry, this domestically produced vehicle serves as a platform for ZU-23 and NSV anti-aircraft weapon systems. The heavier 6-wheel version called Rasi which can been seen on the right is also used to tow artillery. In this picture, the supply elements of an anti-aircraft company have safely reached their destination, and are beginning to unload their cargo in order to provide ground troops with protection from enemy aircraft. The 1930s trend was to build AT rifles to counter enemy armor, especially the lighter vehicles. Finland followed the suit and just before Winter War in late 1939 the 20mm L-39 AT rifle entered service. It proved to be excellent weapon in it’s class with semiautomatic operation, 10-round clip and capability to penetrate 20mm of armor in 60 degrees angle at a distance of 300 meters. This fearsome weapon weighs 49kg and is 2,24 meters long, making it cumbersome like all other AT rifles. Needless to say it proved ineffective against late-war armor and in the summer battles of 1944 it was modified to shoot down armored ground-attack planes. Curiously, it was retained as an anti-helicopter weapon until 1980s. After the Finnish Civil War of 1918, captured Russian water-cooled 7.62mm Maxims proved to be suitable heavy automatic weapons for the Finnish Army. A domestic version with a tripod instead of the Sokolov wheeled mount was therefore put into production in 1921 and it was designated Maxim m09-21. Later m09-32 model featured improvements such as a jacket for rapid snow cooling and recoil booster. 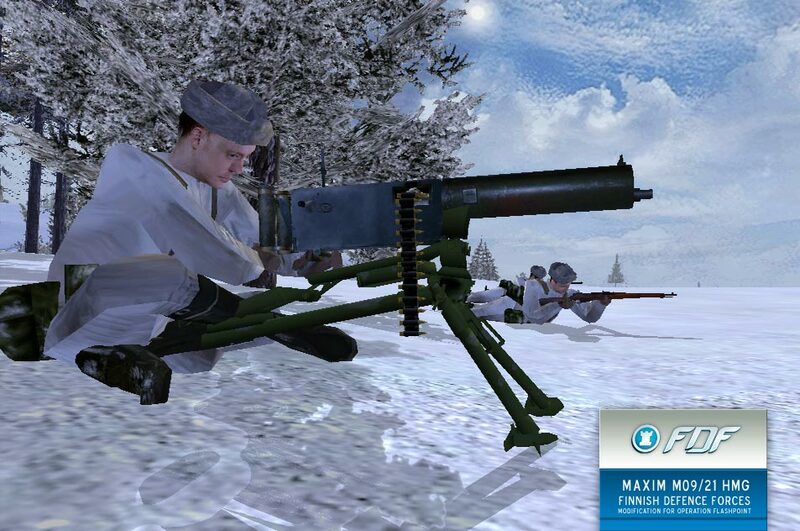 Maxim machineguns were retained in service well into the 60s and 70s, finally being phased out by the KvKK m62 LMG. Finnish soldiers shooting domestic made Heavy Recoilless Rifle 95 S 58-61, nicknamed “Musti”. Even though considered by some as obsolete, Musti is still very lightweight for a crew-served weapon and it can be mounted on most vehicles. Also new hard-nosed warhead designed in 90’s can penetrate T-72 equipped with explosive reactive armor. Though slowly being phased out, Musti is still used in some infantry brigades. 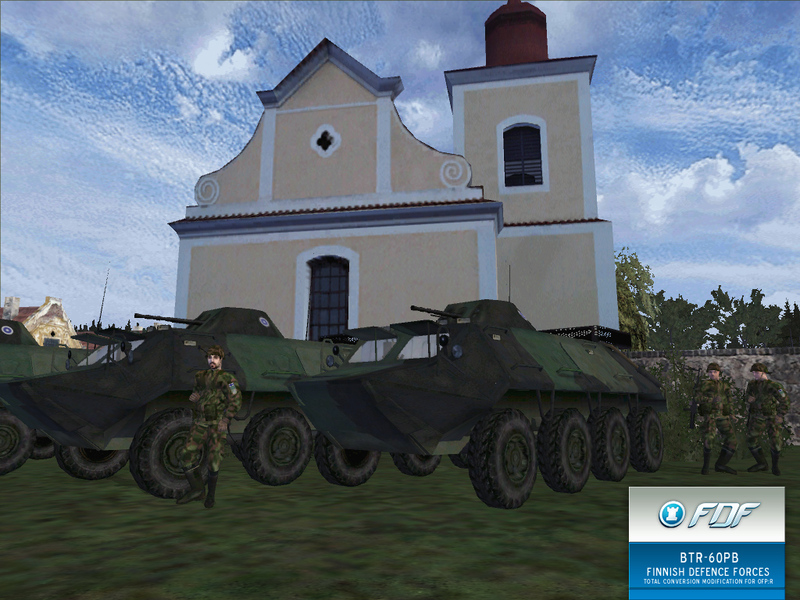 The Soviet-built BTR-60 series wheeled APC has served the Finnish Army faithfully over three decades. Despite their rather temperamental twin gasoline engines, cramped passenger conditions and cumbersome exit hatches the BTR-60PB is still in service in some of the Jaeger Brigades. 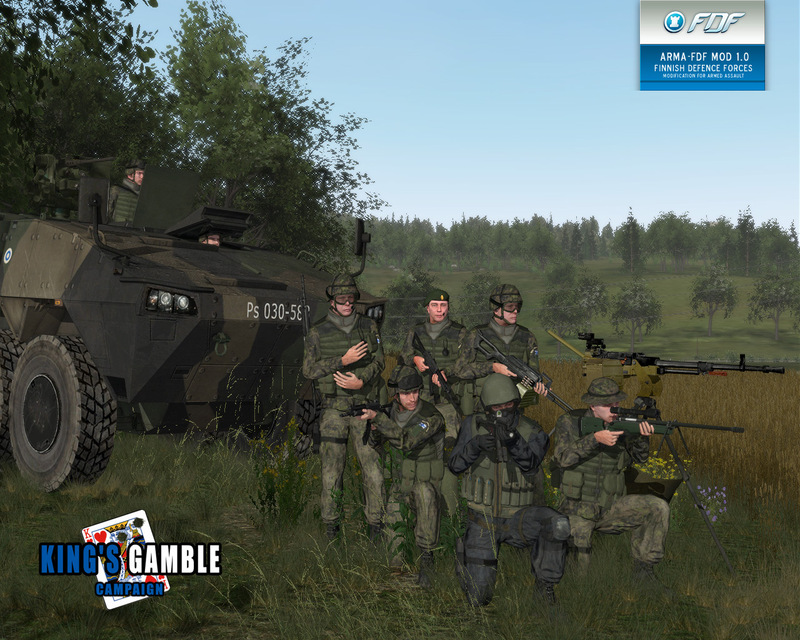 Offering adequate punch with powerful 14.5mm KPVT and lighter 7.62mm PKT machineguns in a relatively cheap and mobile package it is widely regarded as a cheap, useful APC. The BTR-60PB concept has been widely copied around the world, culminating in the Sisu-XA family with some refinements answering to Finnish preferences. 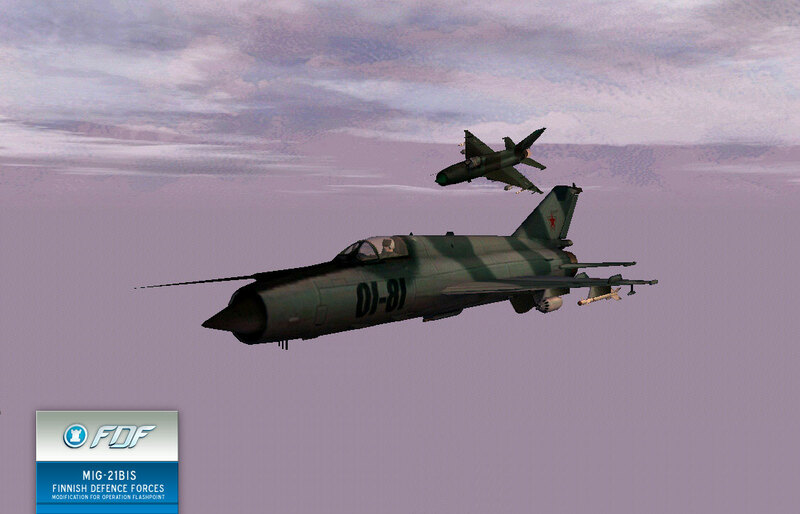 Finnish and Soviet MiG-21bis flying a ‘friendship’ flight over the frontier sometime during the Cold War. MiG-21bis fighters were purchased for Finnish Air Force between 1978 and 1986 and they replaced aging MiG-21F-13 fighters dating back to 1963. 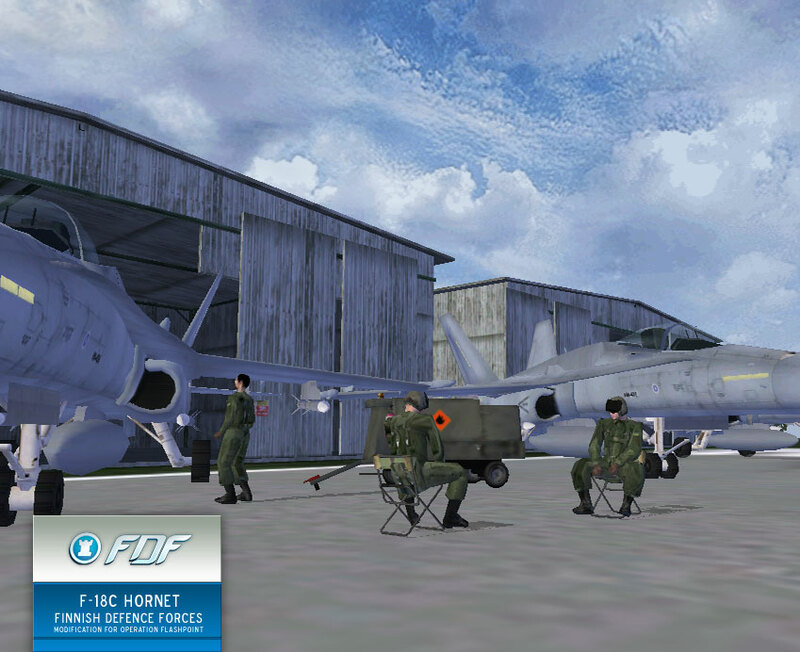 In March 1998 last MiG-21bis fighters were pulled from FAF service as they were retired along with Saab 35J Drakens, both types being replaced by the versatile F-18C Hornet. MiG-21bis is capable of reaching Mach 2. Typical armament includes GSh-23 cannon, rockets and AA missiles. Reworked OFP config with more realistic recoils and weapon specs. New sounds for all OFP weapon systems, weather and environment. 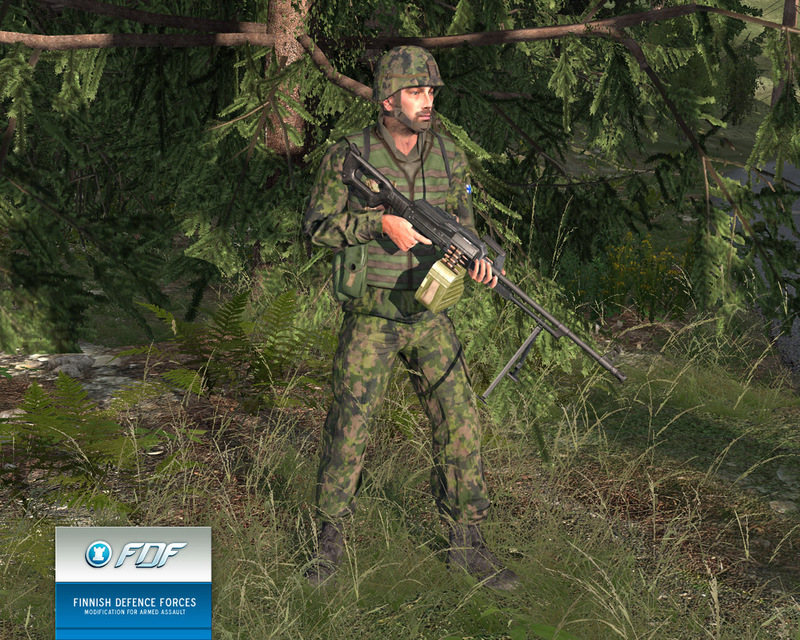 Finnish Defence Forces modelled in meticulous detail. Dozens of new weapons and improvements for OFP weapons. 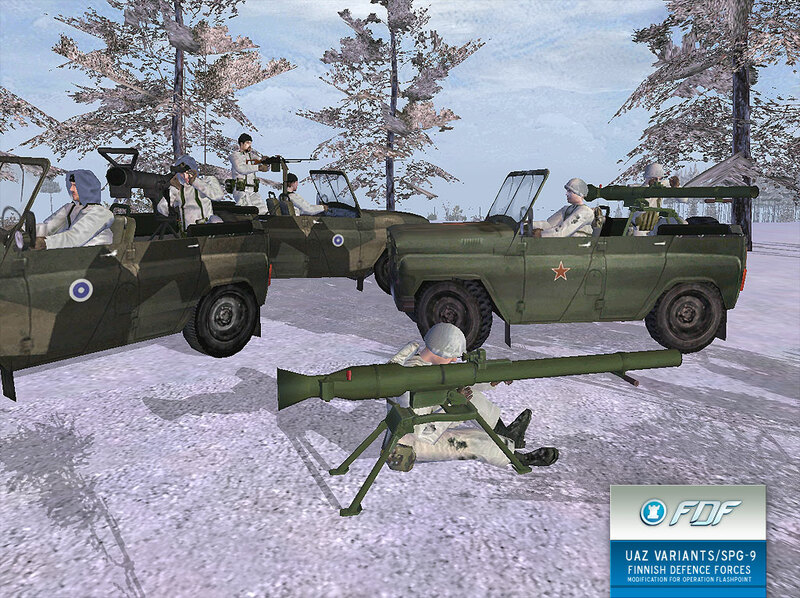 Man-portable modular weapon systems such as HMGs and mortars. 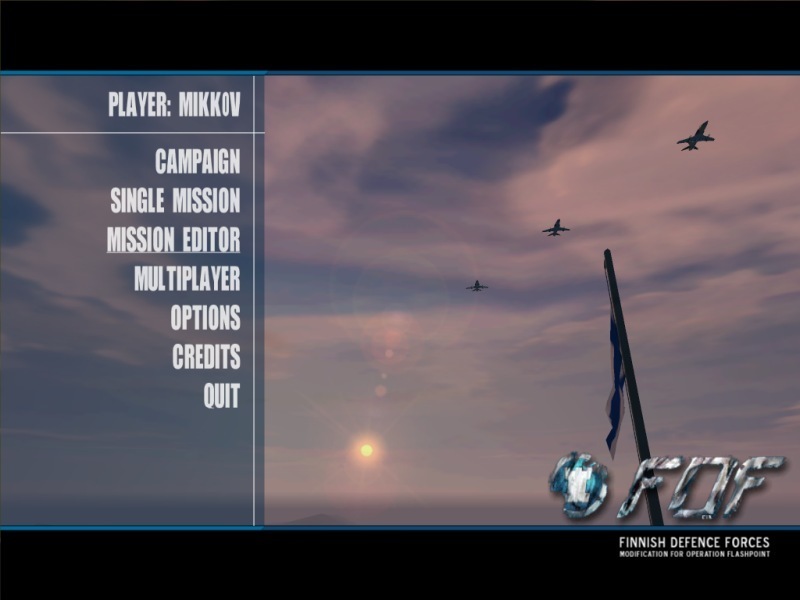 9 single-player missions and 12 multiplayer missions (a/d & coop). 16 new radio voice profiles in Finnish, totalling 3000+ radio voices. Soundtrack feat. Finnish rock band ‘Airut’ and few classical tracks. Custom Island “FDF: Karjala”, Everon island with OFP: Resistance trees, houses, textures, etc. Numerous old OFP bugs fixed, eg. correct-sized BMPs added, forced machinegun lights fixed, gl-grenades taking too much space fixed, medics able to carry LAW etc. Mirror list for FDF Mod 1.0 is located at Downloads page. Piper Chieftains are operated in the Finnish Air Force as liaison/training aircraft. They are Powered by two Textron Lycoming piston engines creating 200hp per engine. Max speed at level speed ca. 330 km/h. 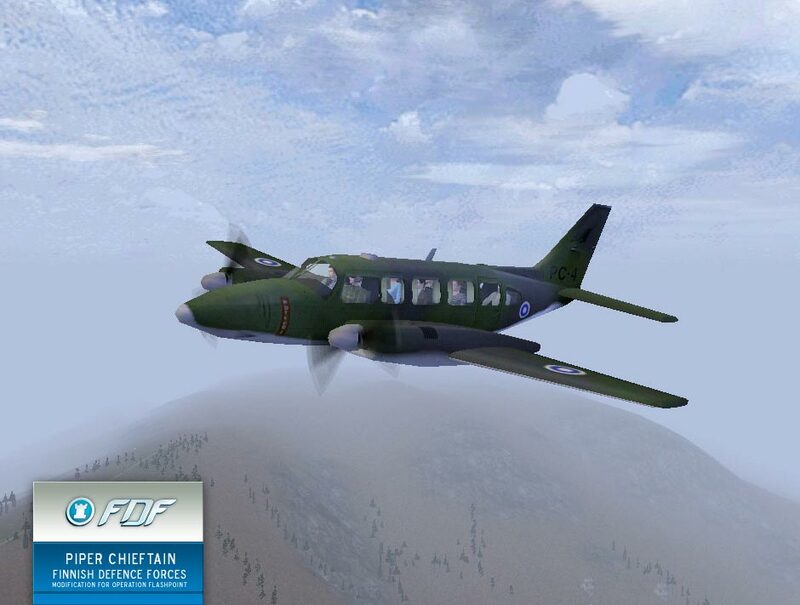 The Piper Chieftain carries 9 VIP passengers but maybe used as a paradrop aircraft in emergencies. FDFMod Team proudly presents the Russian made 12.7mm NSV AA Machinegun, also known as “Utes”. 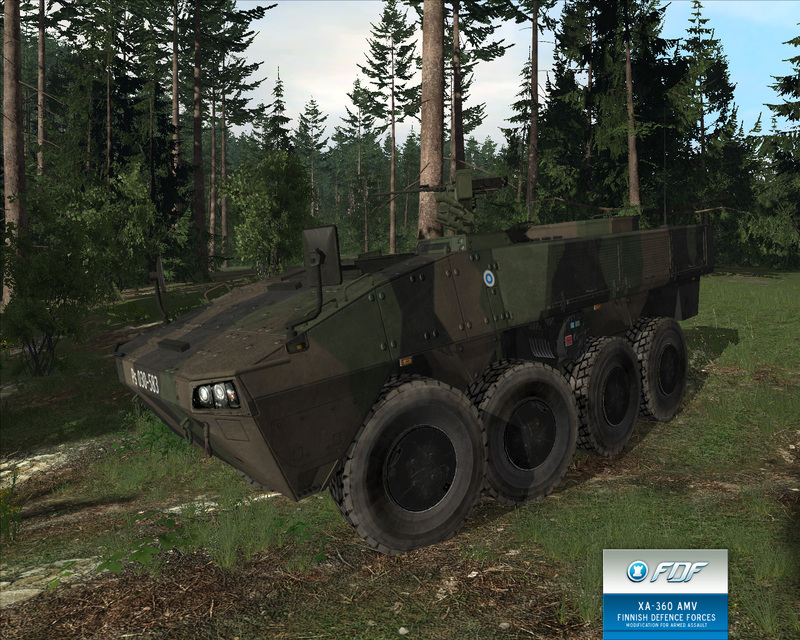 The NSV forms the basis of the close air defence of the Finnish jaegers and APCs. Our NSV works without any scripting or tweaking, it only needs to be placed on the map and it will work as shown in this multiplayer video. 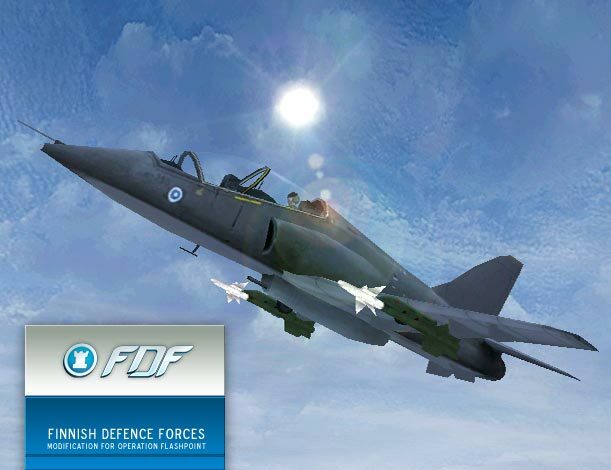 Reworked version of British Aerospace Hawk Mk51 training/light attack aircraft has been finalized for FDF mod. New version includes standard grey paint scheme, working HUD with noisy stall warning and incoming missile alert system. Two versions include AA variant with 30mm Aden cannon and two AIM-9 Sidewinder missiles. Air-to-Ground version is also included for playability reasons and it’s armed with Mk81 bombs, rockets and cannon. Although Hawk is capable light attack aircraft, it’s is uncertain would FDF use some of it’s 50+ aircraft in such role during wartime. 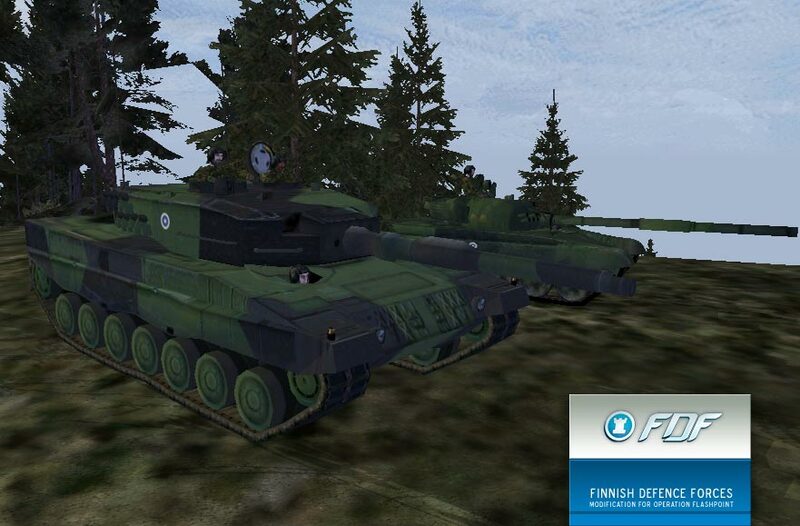 As the first Leopard 2A4s touch the Finnish soil for the first time in real life, we are proud to present Leo 2 in Finnish Army paint scheme. On the background old T-72m1 is giving way to this new Chobham-layered steel monster equipped with a hard-biting 120mm Rheinmetall smoothbore gun. Representing the finest traditions of German tank building, Leopard 2 now equips many countries such as Germany, Switzerland, Spain, Holland, Sweden, Norway and now finally Finland. A Finnish motorcycle scout is being briefed for his next mission by an officer of the Mechanized Jaeger Corps. Reservist NCO is also receiving lates intel about possible locations of enemy forces. BMP2 stands ready to give fire support for dismounted infantry whereever needed. 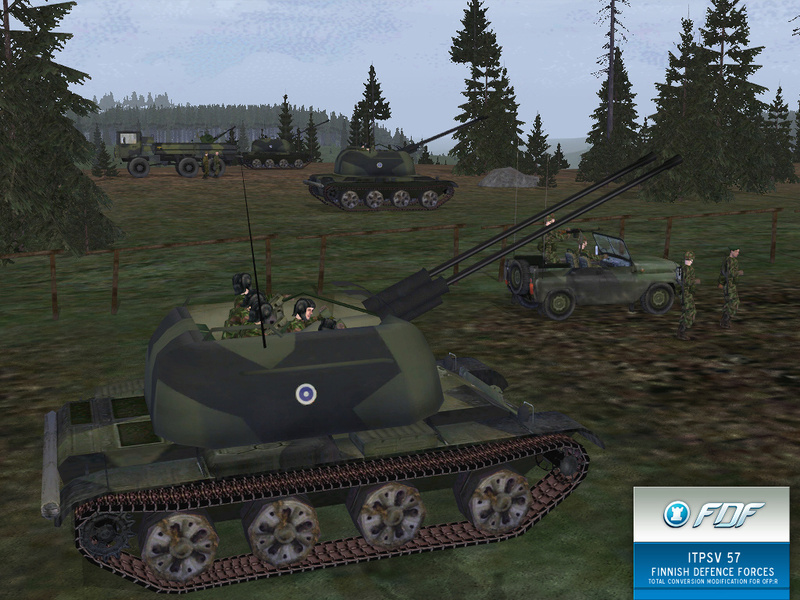 Note that the vehicle is in correct size and has two-man turret as in real life. Motorcycle scouts has a folding-stock RK62m76 along with other special gear. The has a chart bag hanging on officer’s waist while reservist’s equipment includes old-pattern field shovel and standard army rubber boots. Listen below an example Finnish in-combat radio voice in MP3 format, recorded while FDF recon patrol has engaged with enemy mechanized force in Nogova. The sounds also include Goeth’s LDDK sound pack weapon sounds. At the moment FDF mod has 10 different radio voice profiles ready. Stay tuned for more. Signals NCO receiving orders from a Jaeger Captain inside standard finnish half-platoon tent. Others Jaegers on the background get some well-deserved rest in the tender heat of a iron stove (kamiina). Great deal of chopped wood is required to keep the fire burning during the cold seasons. 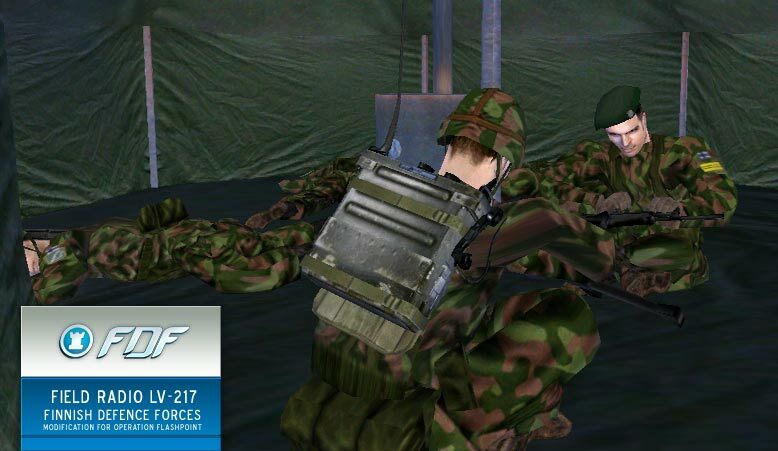 The LV-217 (Venttiseiska) radio is standard FDF company level communication device and is essential part of any command squads arsenal. 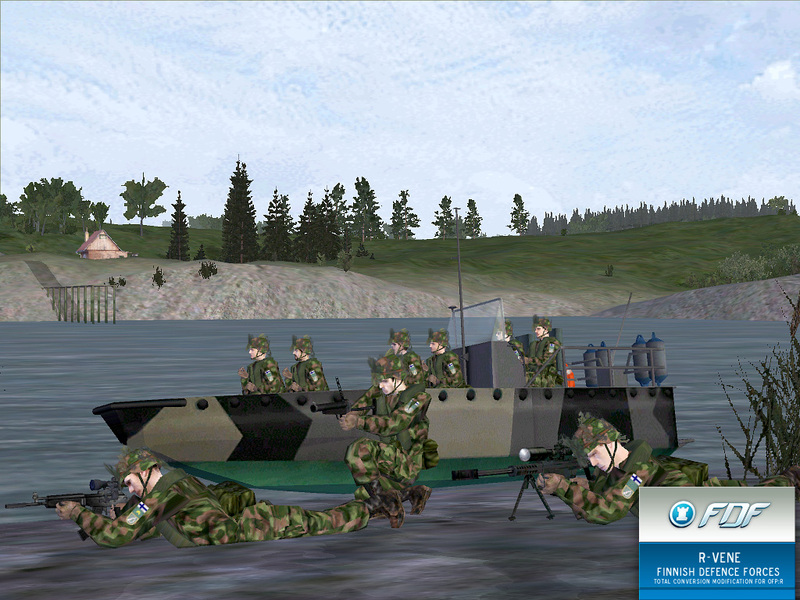 Protecting the coasts and islands of Finland, the Coastal Jaegers of Nylands Brigade have made a landing on small island with their Zodiac rubber boat under the supervision of an officer. Trained specially for the harsh conditions of coast and island fighting, the Coastal Jaegers are equipped with standard Jaeger equipment with RK62s, 66KES88 and KvKK 62 LMGs. They also carry life jackets for the duration of shipborne operations. 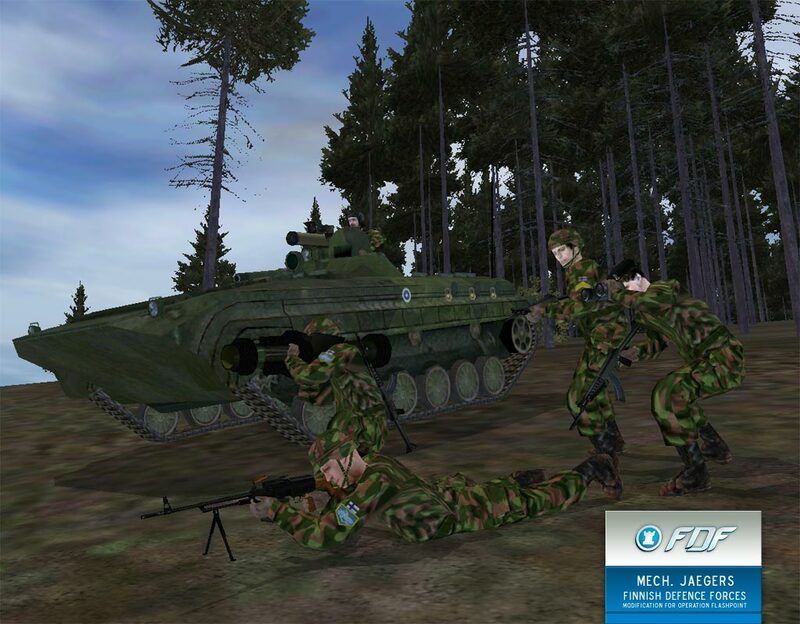 Finnish Mechanized Jaegers (mech infantry) dismount their BMP-1P infantry fighting vehicle and take up positions after establishing contact with enemy forces. Heavily armed Mech Jaeger squad ride with BMP-1P which has 73mm smoothbore recoilless gun and PstOhj82M (Spigot) missile mounted on the roof. 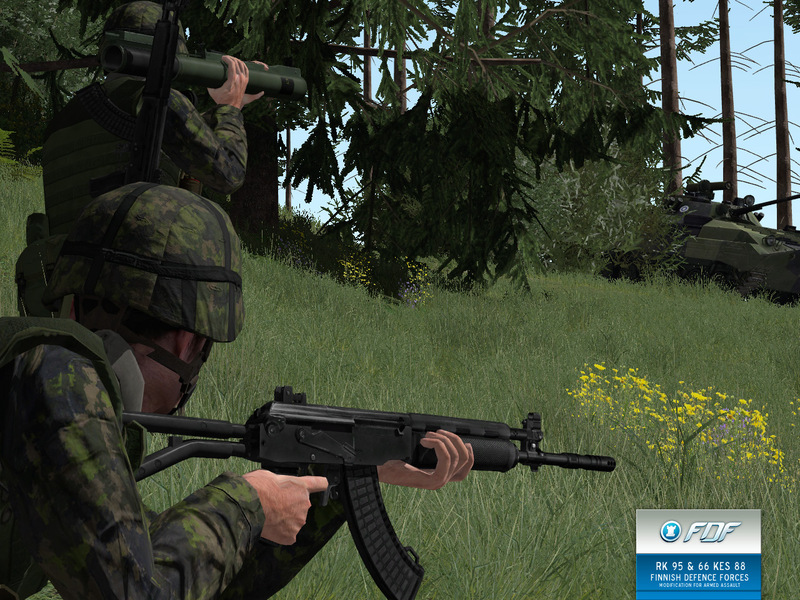 The men are armed with PKM machine guns, RK62 assault rifles, APILAS and 66KES88 rocket launchers. 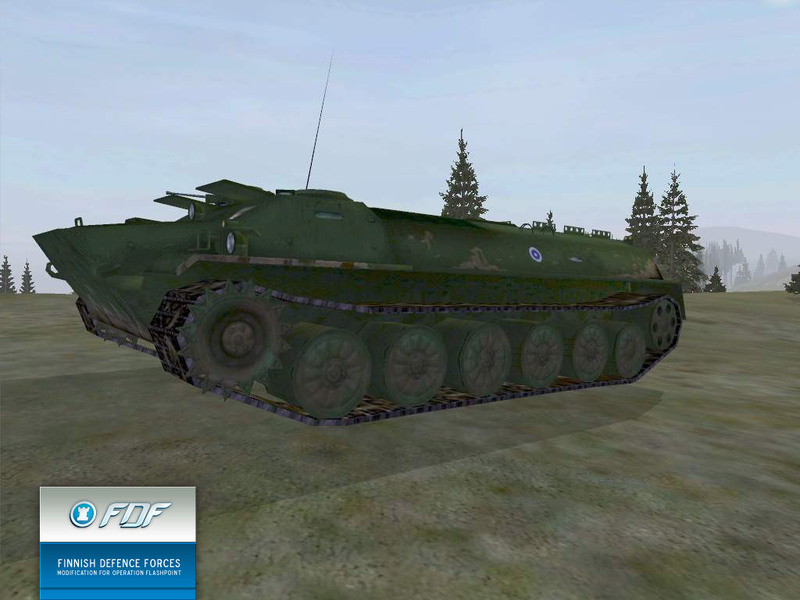 Note the new BMP-1 model scaled into realistic proportions from BISs oversized BMP. Pasi is nearly finished, only some minor details in the textures need polishing. An “armoured triple-axle all-terrain vehicle” armed with the 12.7mm NSV heavy machinegun, Sisu XA-185, nicknamed Pasi, is an internationally noted Finnish APC. 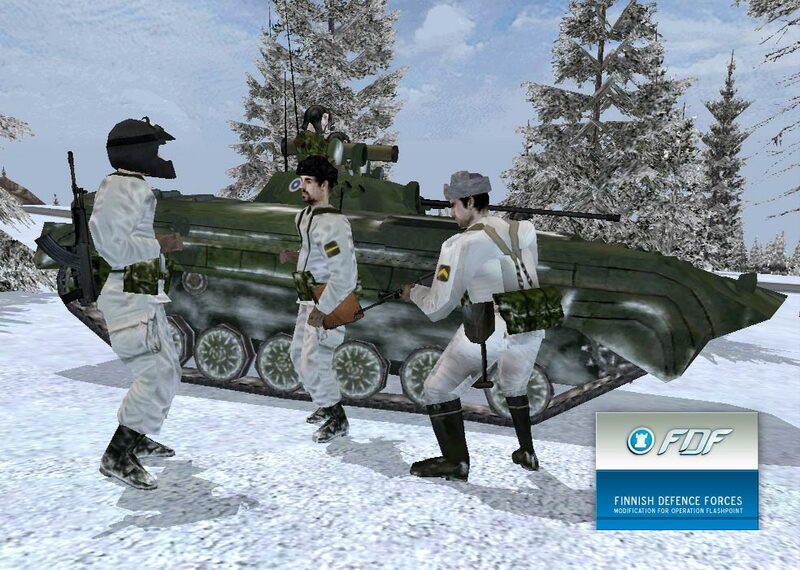 This version of Pasi is based on a completely new model made by the FDF-mod team. Guarding the checkpoints on Nogova’s dangerous roads, Finnish MP team has just stopped a car for routine inspection. A firearm was spotted on the back seat of the vehicle and MPs move swiftly to handcuff and detain the suspect. 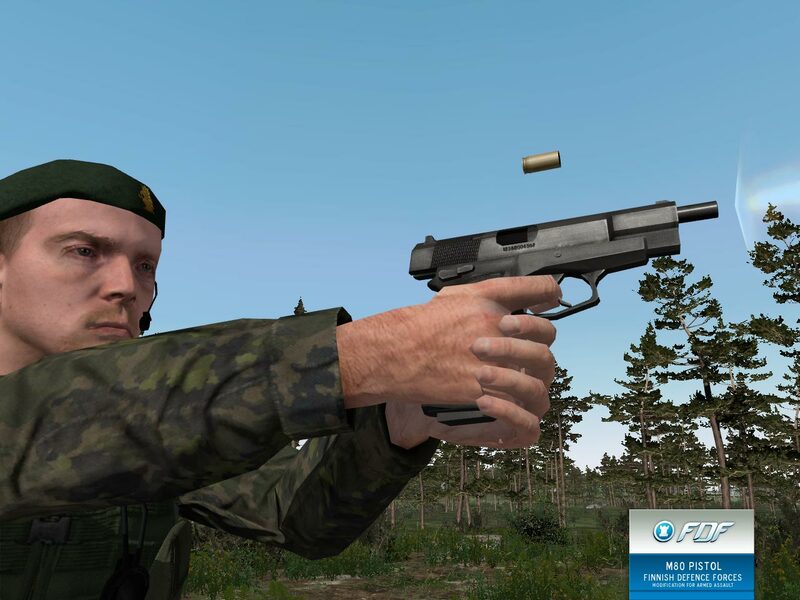 The Military Policemen are equipped with kevlar helmets including plexiglass face cover, RK62s and M80 pistols. Other equipment includes Rem. 870 shotguns, MP5A3 SMGs and M85 Sniper Rifles. Finnish Defence Forces squad on patrol somewhere on the mountains of Nogova. They are equipped with mixed outfits of kevlar and steel helmets, green land forces beret and m91 field caps. 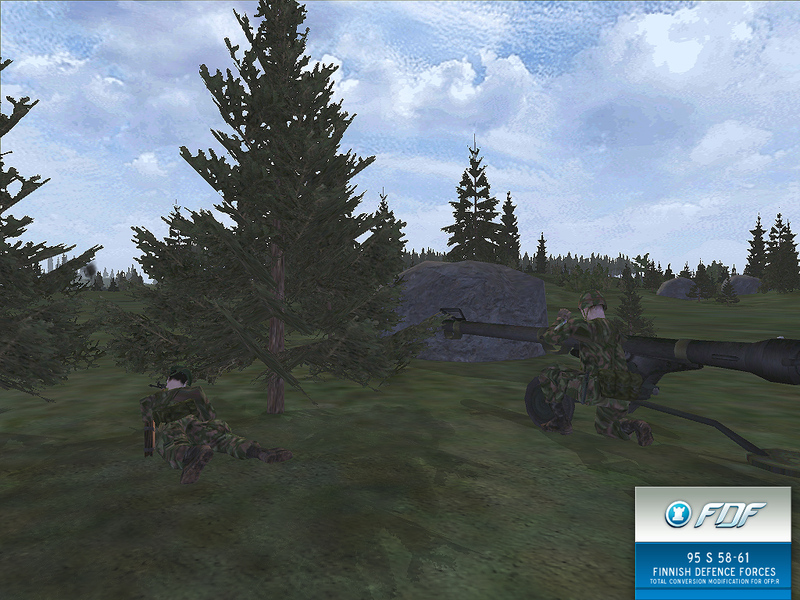 Equipment consists of rk 62s and 95s, APILAS heavy disposable rocket launcher and KvKK 62 light machinegun. Reservist winter soldiers (grey fur cap) and sissi soldiers (black cap) with RK 62s on Winter Nogojev. Summer Reservists with steel helmets and old pattern camo cap are worked upon. Jaegers and Jaeger NCOs will naturally have kevlar helmets and jaeger officers will have green berets. Click here for larger pic. Another divine beauty from Soviet Union – MT-LBv – is now finished. This low-silhouette multi-purpose vehicle is fully amphibious and equipped with 7.62mm PKT machine gun. 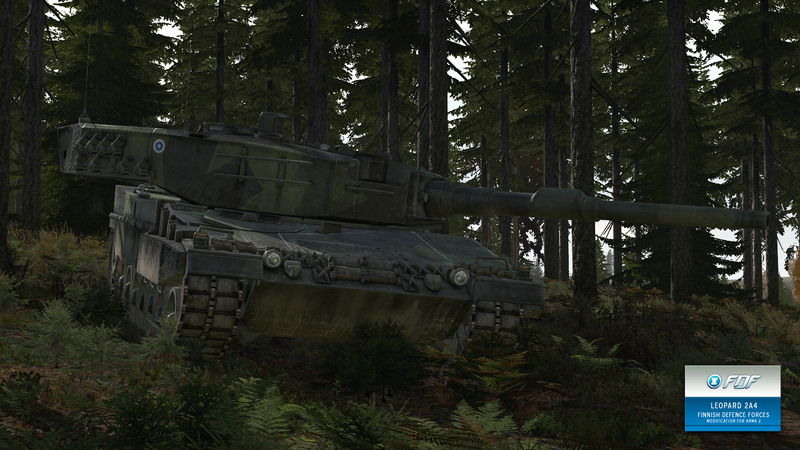 MT-LBv is arctic variant with wider (57 cm) track and improved floating abilities. MT-LBv is textured by Una. Model by Desert OFP Project – Lavos. Our web site is finally open for public. Not much to see yet – except those nasty vehicles and guns at Features-page. Use links at left to navigate and remember to visit our forums.